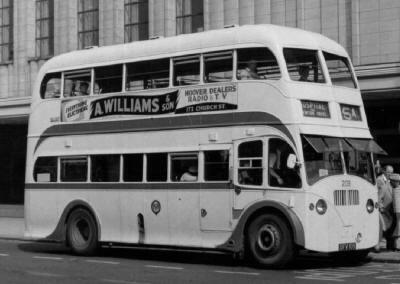 Bus 151 (FV8993) 1937 Leyland Titan TD4, Body H.V.Burlingham FH25/23C, withdrawn 1958. Bus 152 (FV8994) 1937 Leyland Titan TD4, Body H.V.Burlingham FH25/23C, withdrawn 1953. 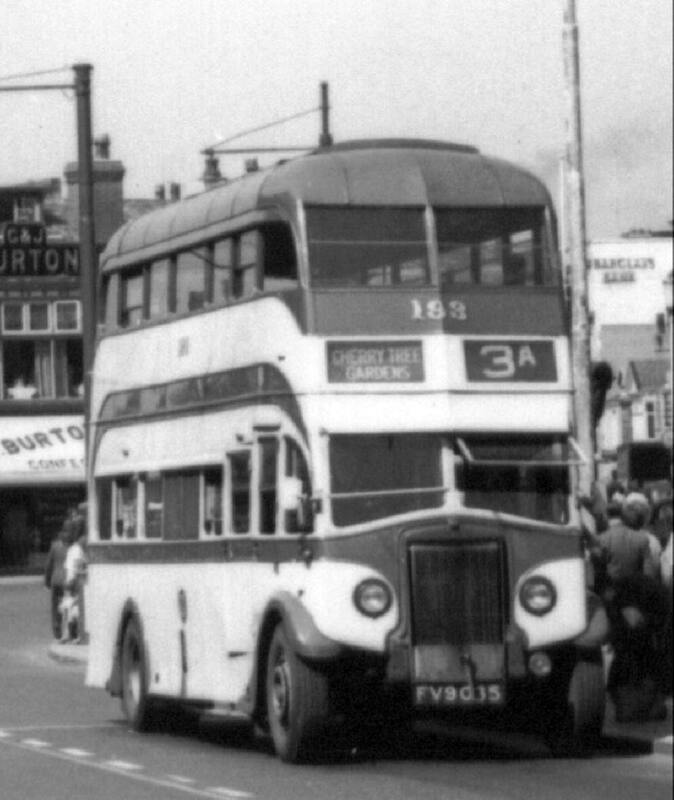 Bus 153 (FV8995) 1937 Leyland Titan TD4, Body H.V.Burlingham FH25/23C, withdrawn 1957. Bus 154 (FV8996) 1937 Leyland Titan TD4, Body H.V.Burlingham FH25/23C, withdrawn 1953. 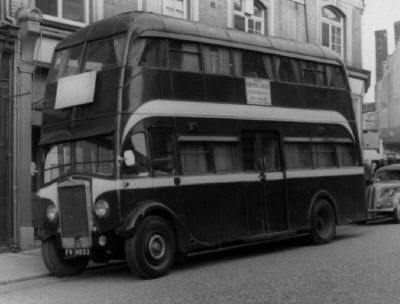 Bus 155 (FV8997) 1937 Leyland Titan TD4, Body H.V.Burlingham FH25/23C, withdrawn 1958. 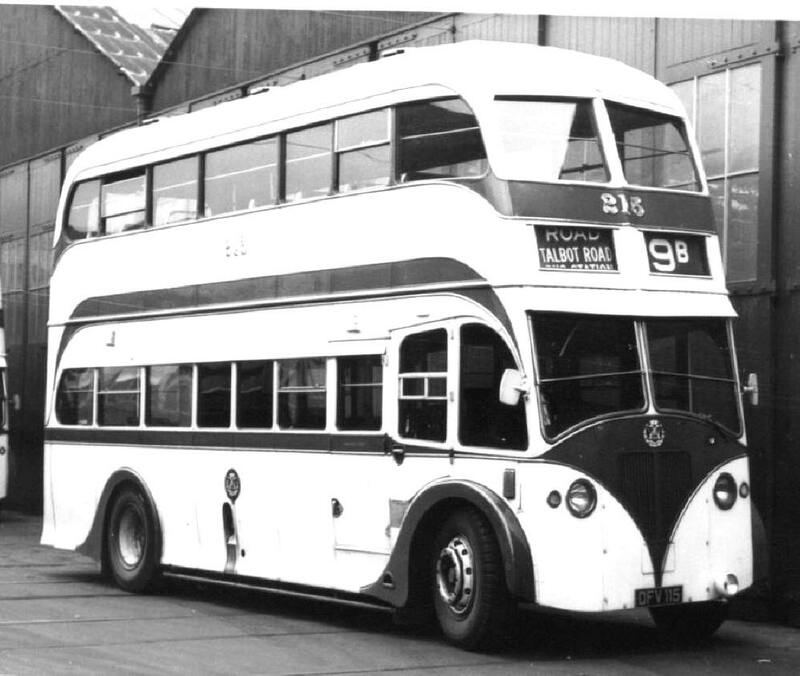 Bus 156 (FV8998) 1937 Leyland Titan TD4, Body H.V.Burlingham FH25/23C, withdrawn 1956. 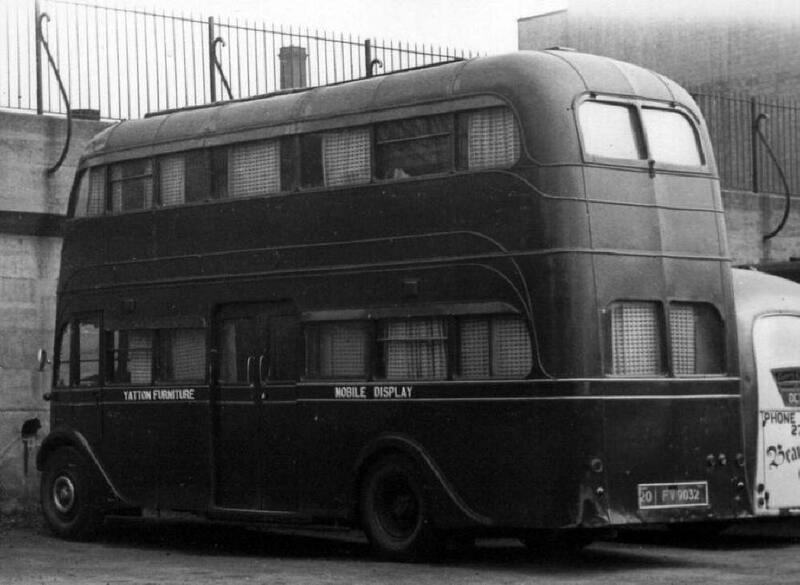 Bus 157 (FV8999) 1937 Leyland Titan TD4, Body H.V.Burlingham FH25/23C, withdrawn 1953. Bus 158 (FV9000) 1937 Leyland Titan TD4, Body H.V.Burlingham FH25/23C, withdrawn 1957. 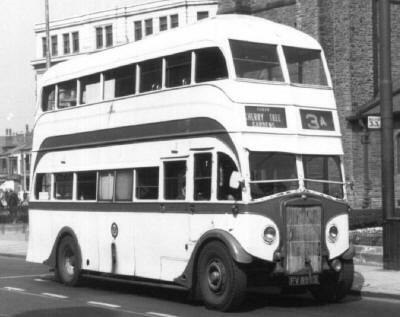 Bus 159 (FV9001) 1937 Leyland Titan TD4, Body H.V.Burlingham FH25/23C, withdrawn 1954. 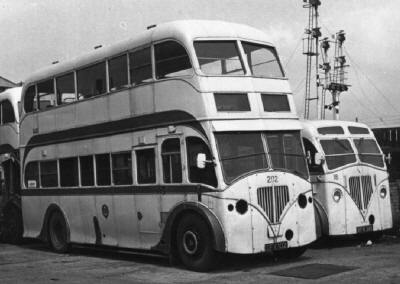 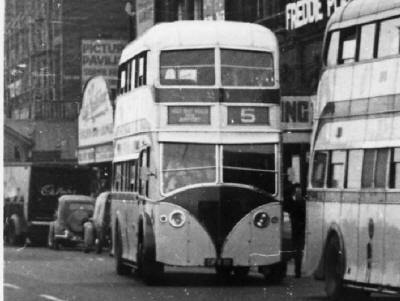 Bus 160 (FV9002) 1937 Leyland Titan TD4, Body H.V.Burlingham FH25/23C, withdrawn 1956.
as Track Spraying Car 7, withdrawn ? 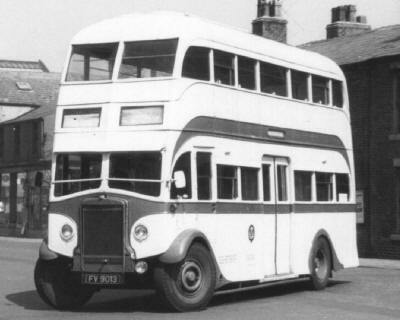 Bus 161 (FV9003) 1937 Leyland Titan TD4, Body H.V.Burlingham FH25/23C, withdrawn 1954. 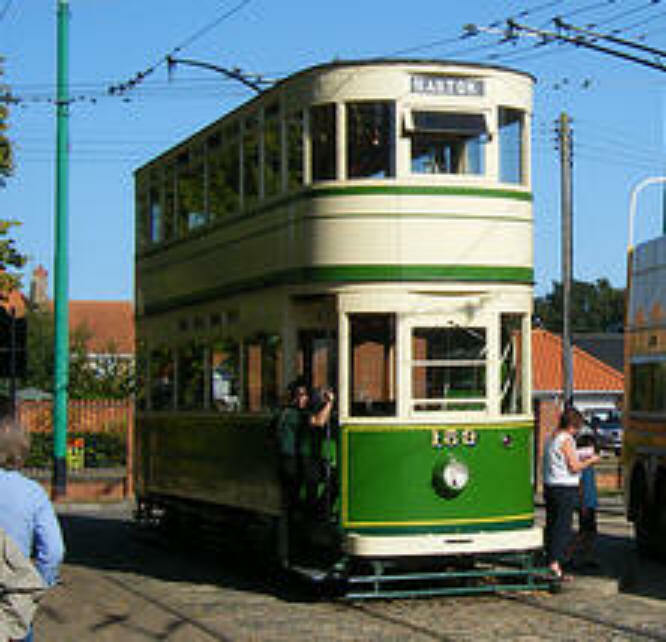 Bus 162 (FV9004) 1937 Leyland Titan TD4, Body H.V.Burlingham FH25/23C, withdrawn 1954. Bus 163 (FV9005) 1937 Leyland Titan TD4, Body H.V.Burlingham FH25/23C, withdrawn 1958. 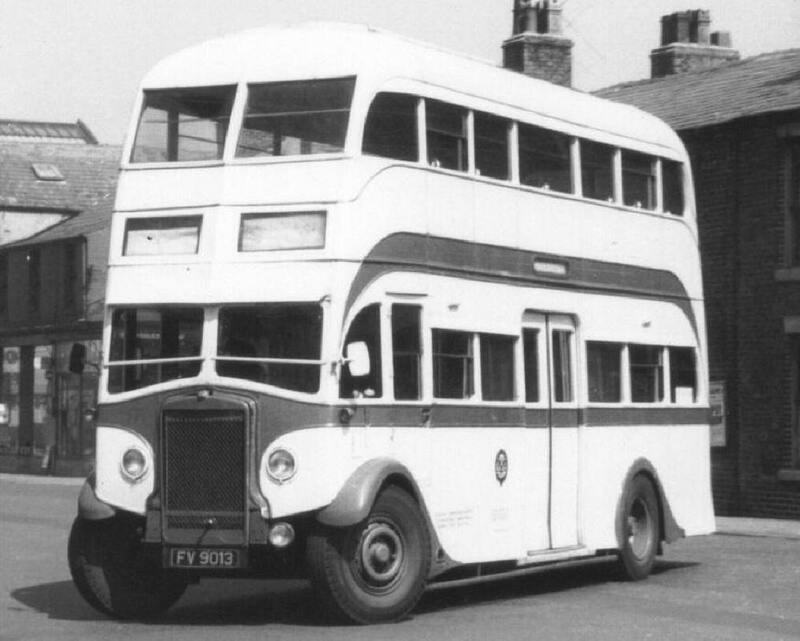 Bus 164 (FV9006) 1937 Leyland Titan TD4, Body H.V.Burlingham FH25/23C, withdrawn 1954. 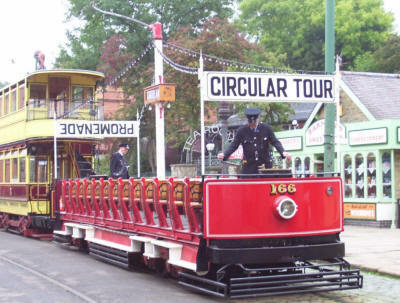 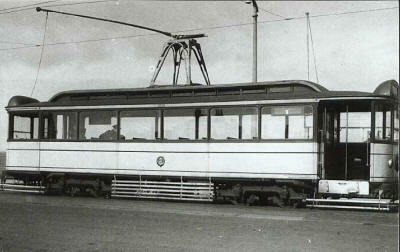 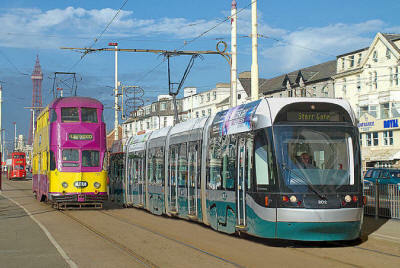 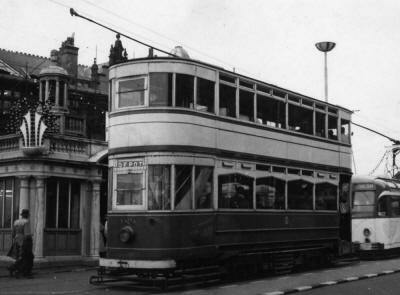 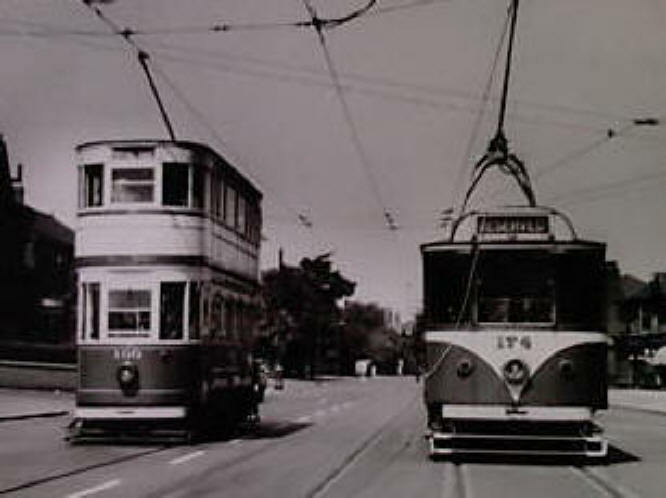 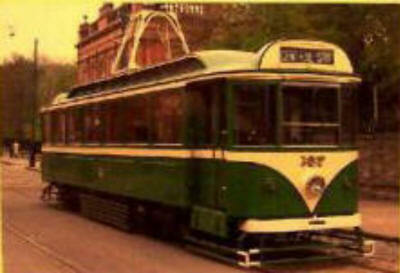 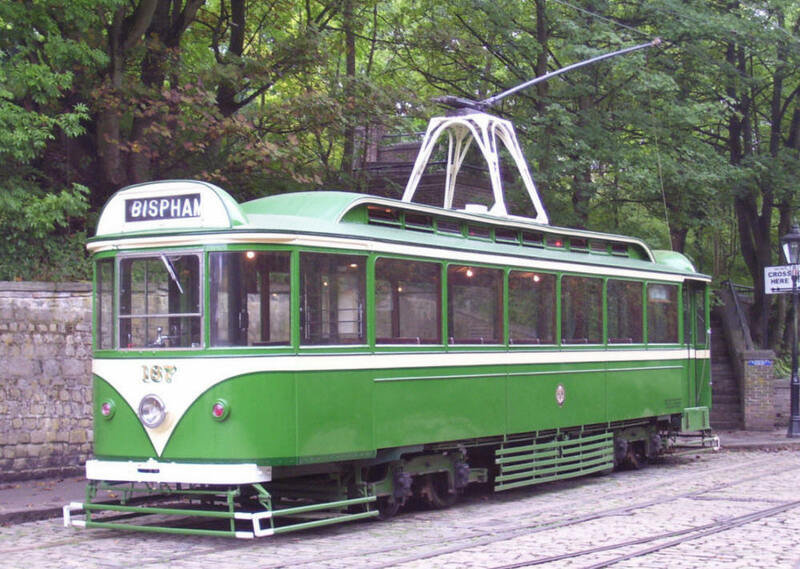 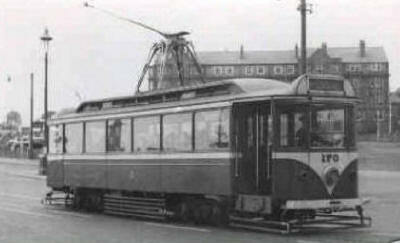 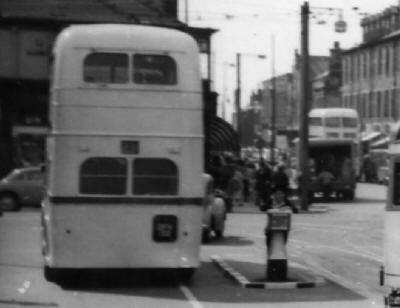 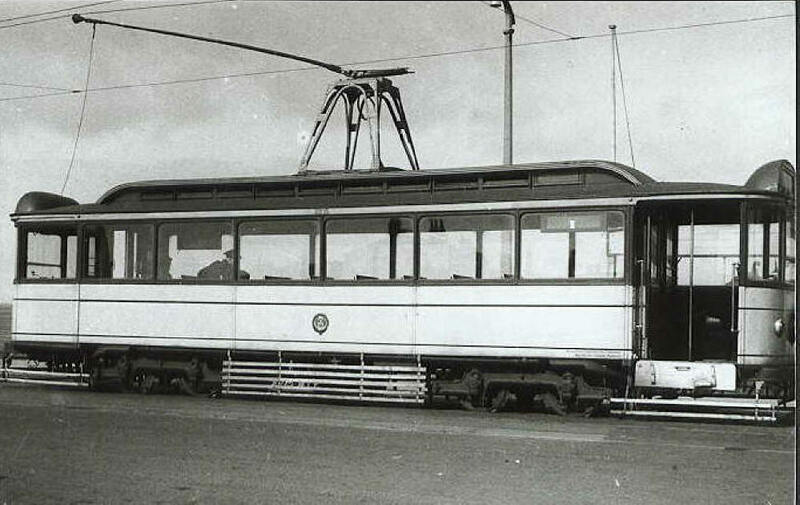 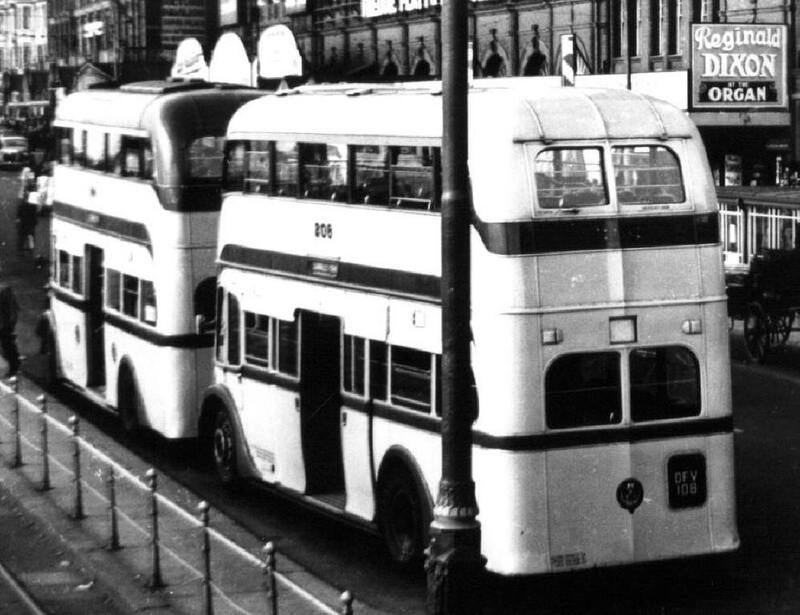 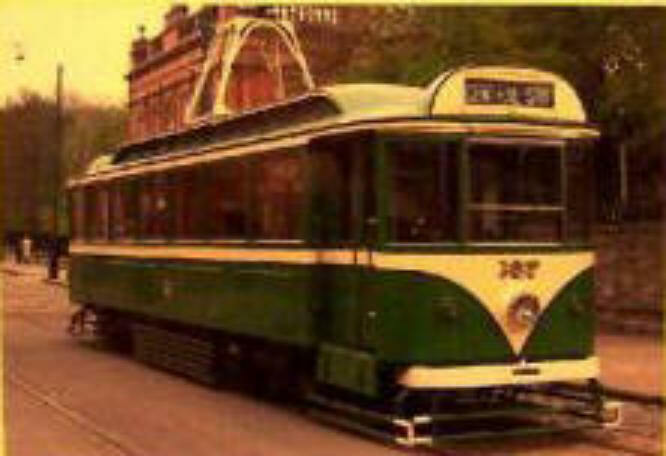 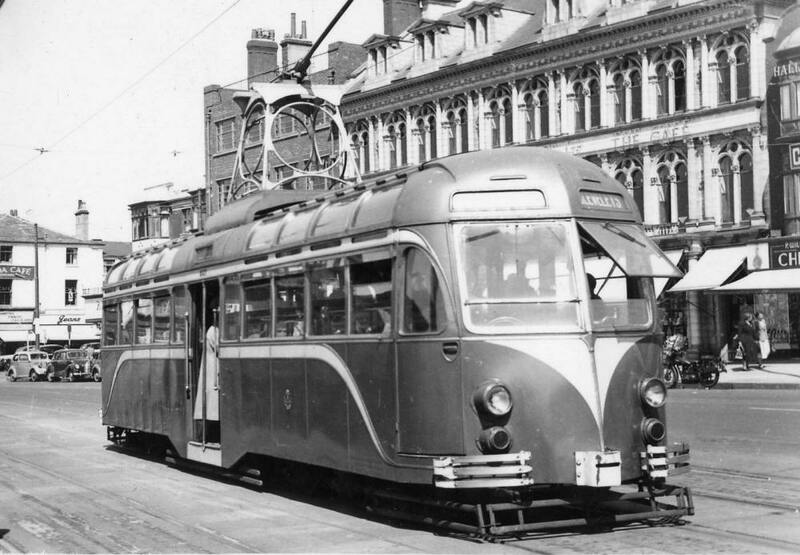 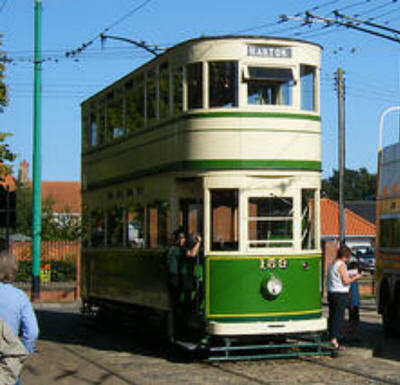 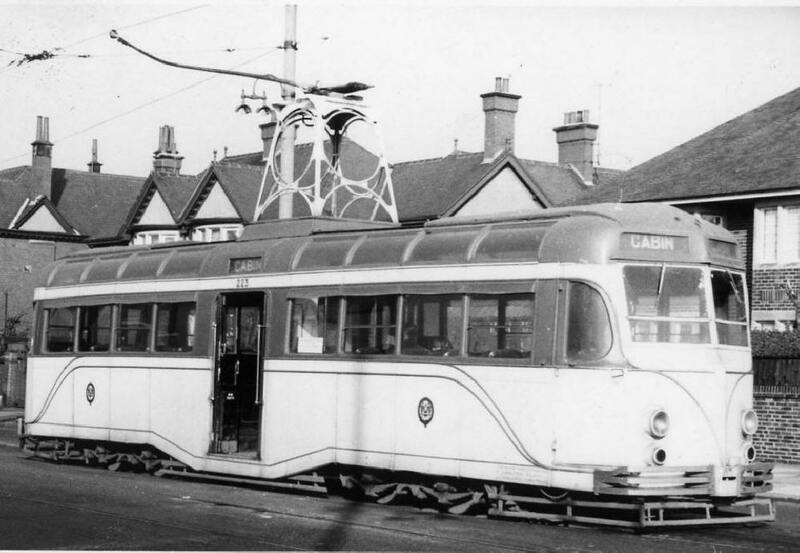 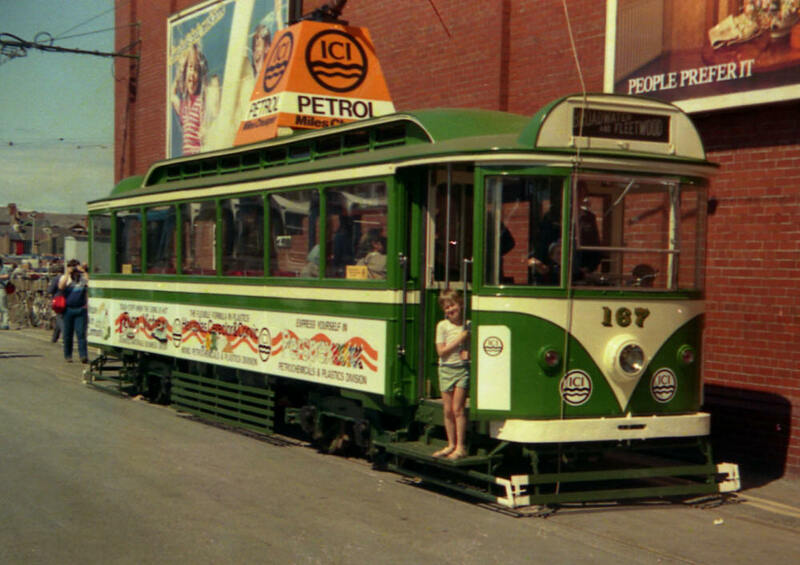 Television Broadcasting Tram, withdrawn ? 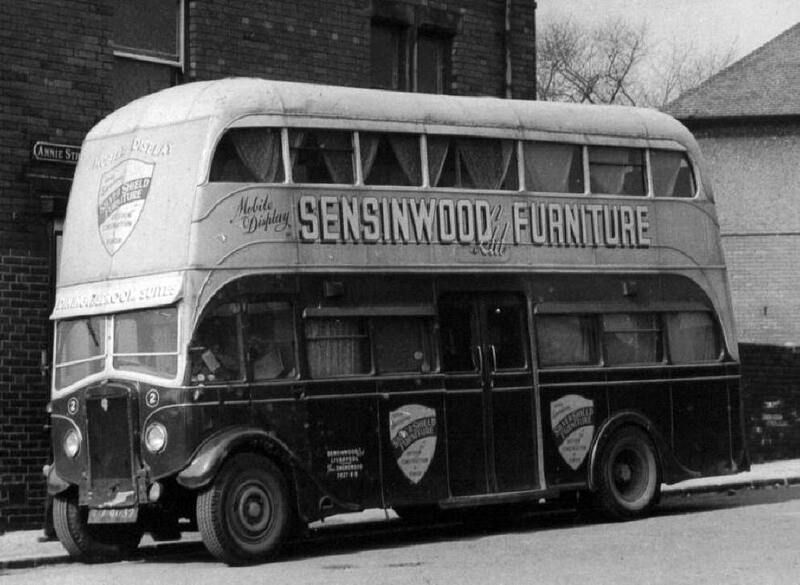 Bus 165 (FV9007) 1937 Leyland Titan TD4, Body H.V.Burlingham FH25/23C, withdrawn 1953. 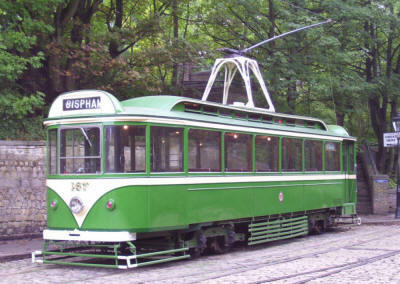 Television Broadcasting Tram, withdrawn ? NOW PRESERVED. 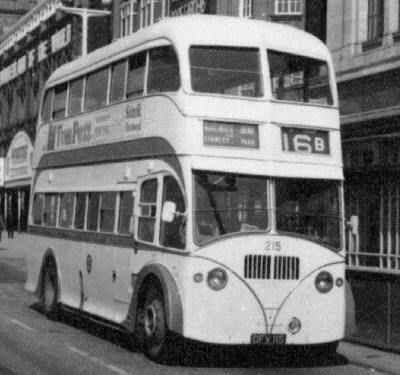 Bus 166 (FV9008) 1937 Leyland Titan TD4, Body H.V.Burlingham FH25/23C, withdrawn 1957. 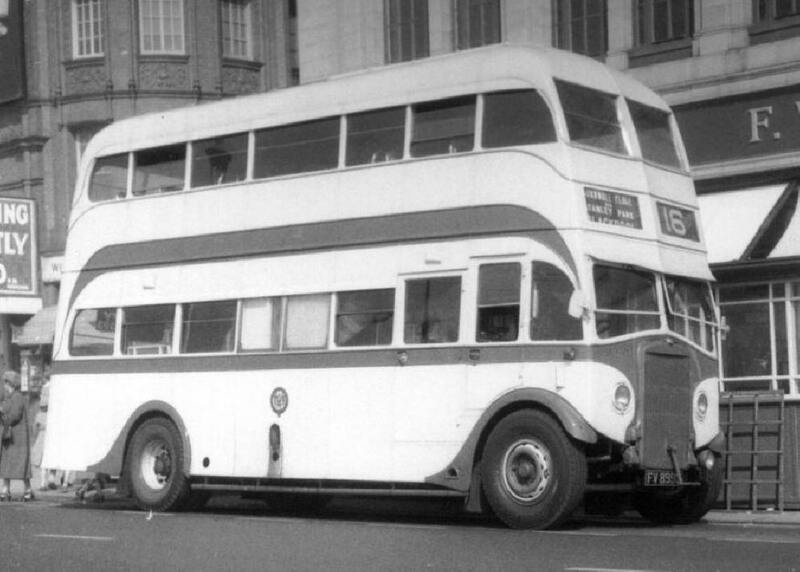 Bus 167 (FV9009) 1937 Leyland Titan TD4, Body H.V.Burlingham FH25/23C, withdrawn 1957. One) Illuminated Car, 1968 renumbered 732. 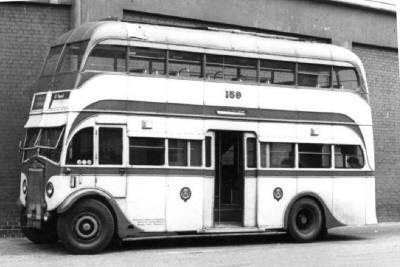 Bus 168 (FV9010) 1937 Leyland Titan TD4, Body H.V.Burlingham FH25/23C, withdrawn 1957. Bus 169 (FV9011) 1937 Leyland Titan TD4, Body H.V.Burlingham FH25/23C, withdrawn 1954. 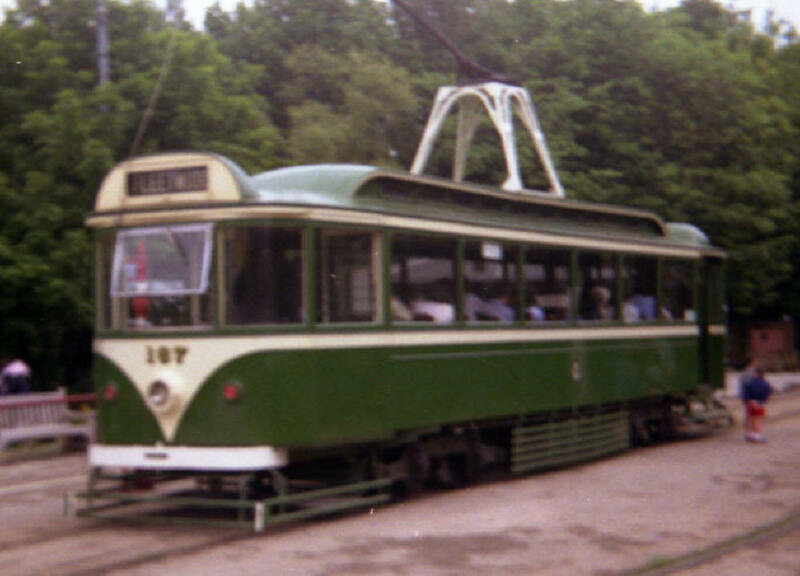 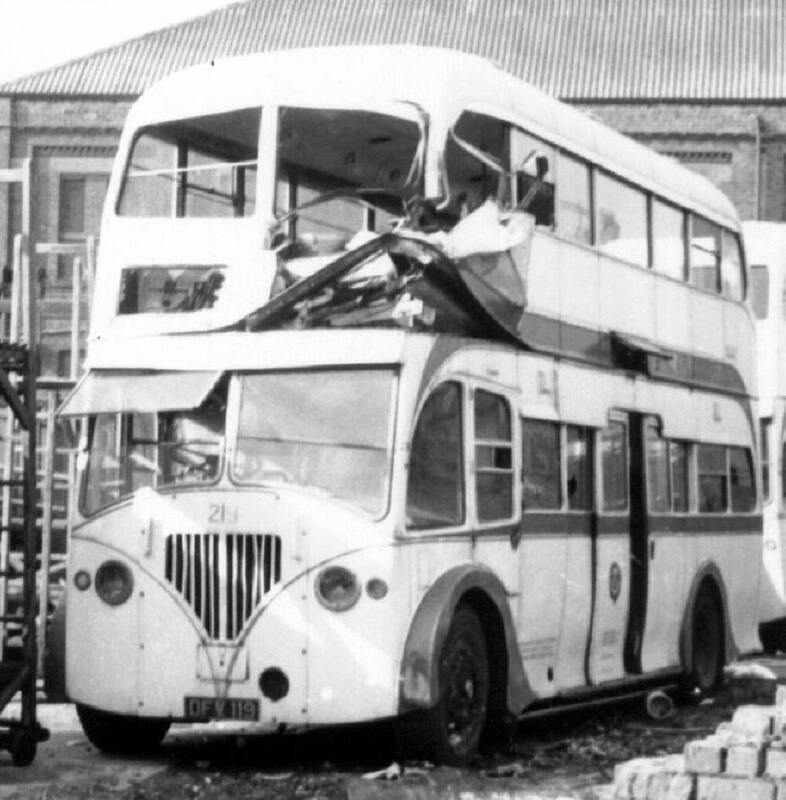 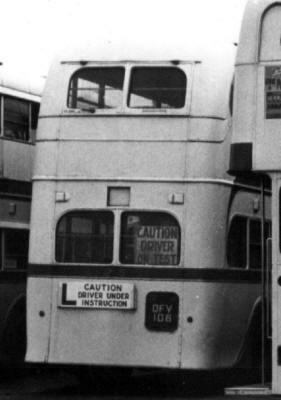 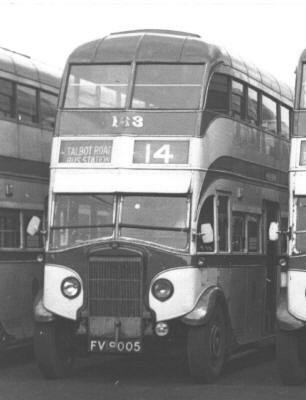 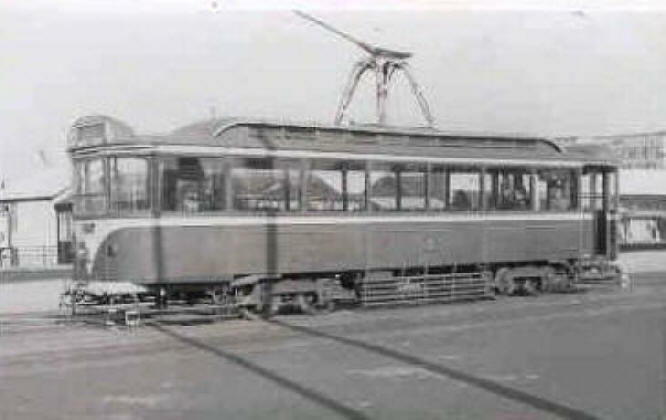 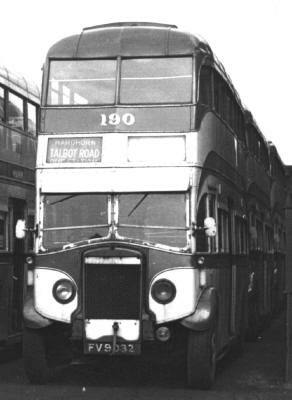 Gang Car 170, withdrawn 1964. 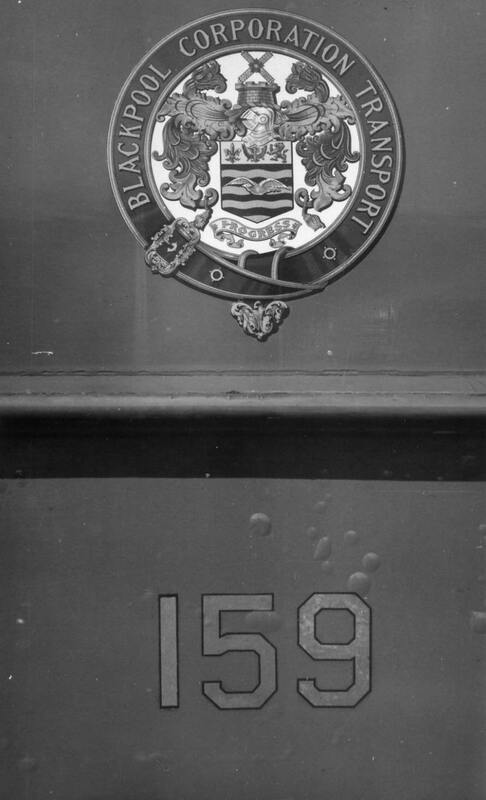 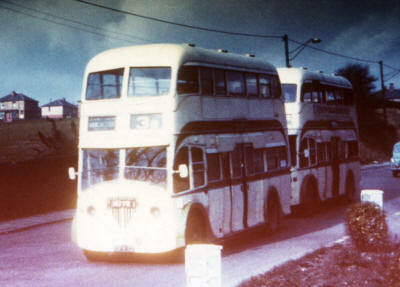 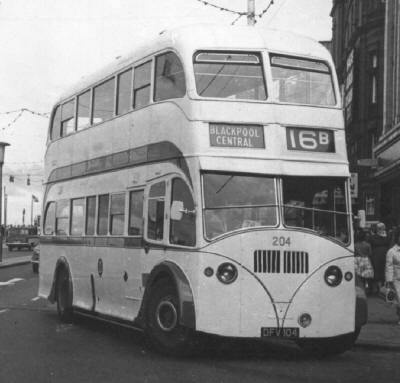 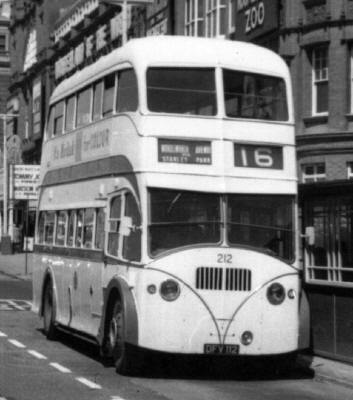 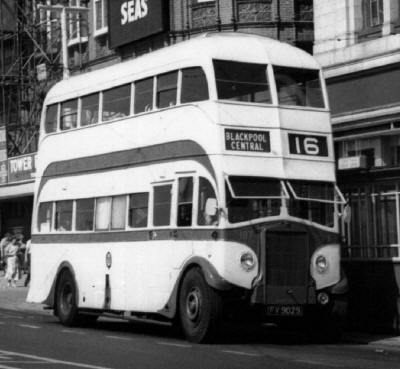 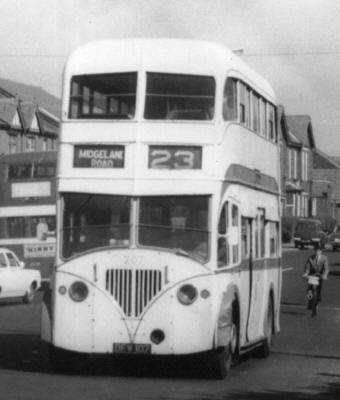 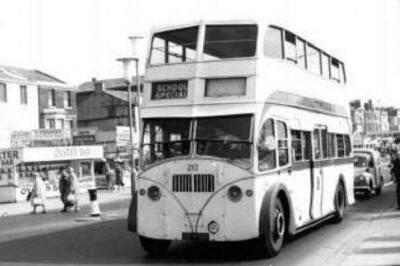 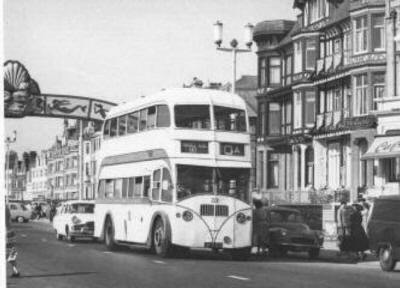 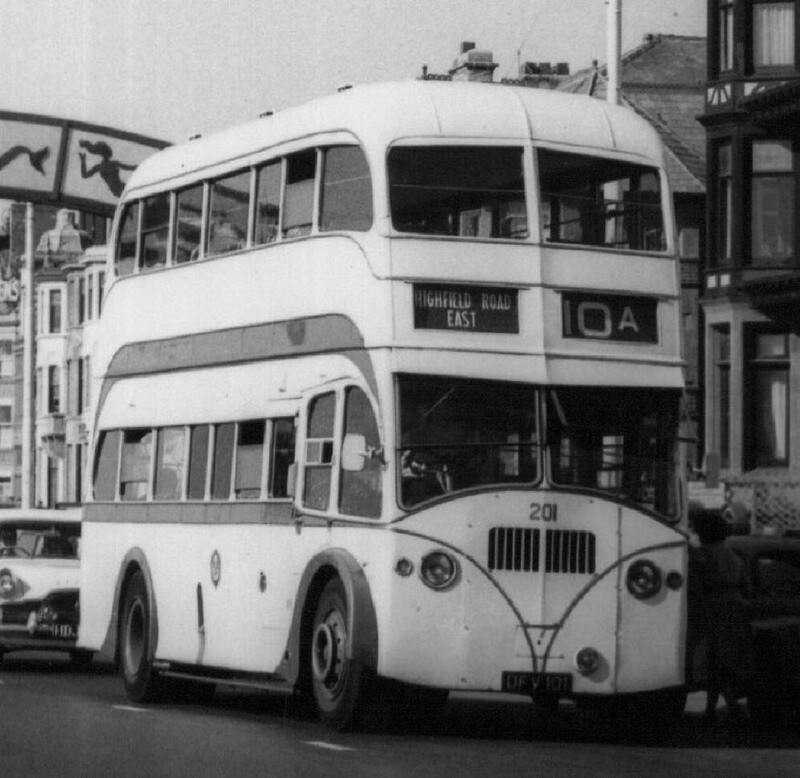 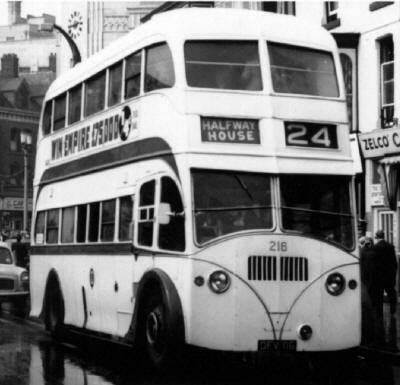 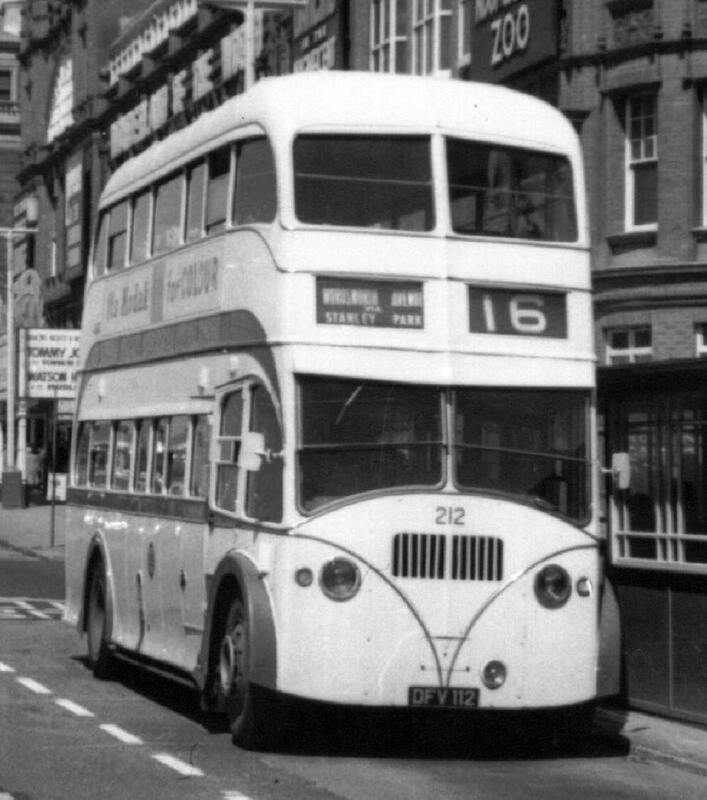 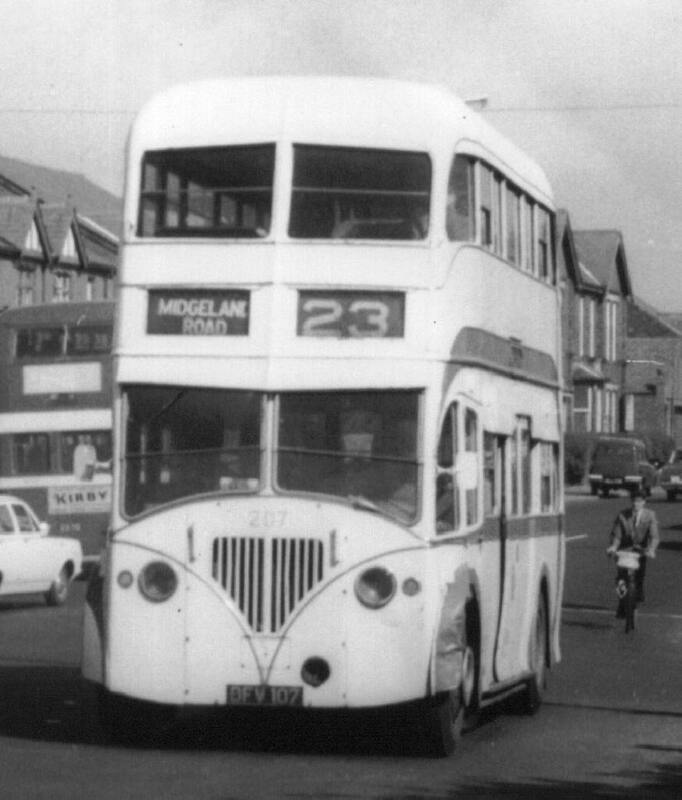 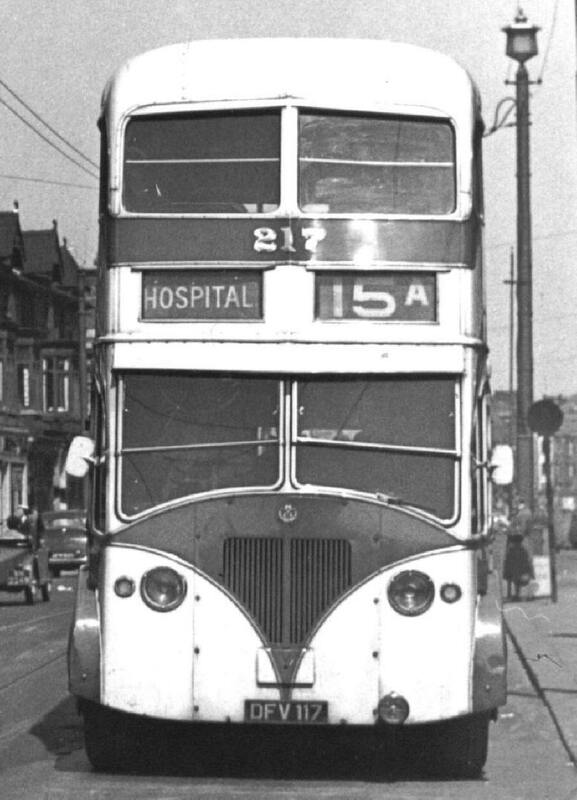 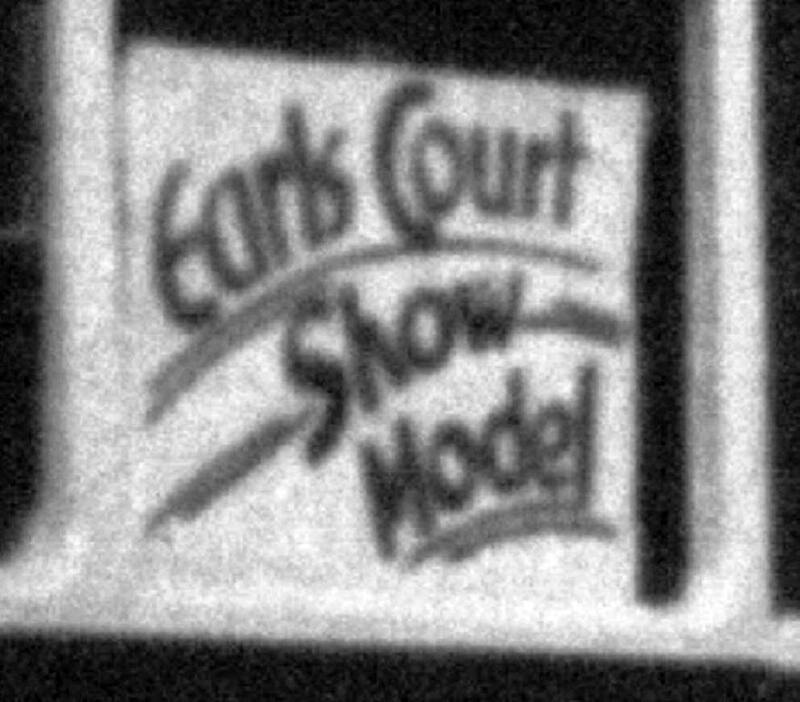 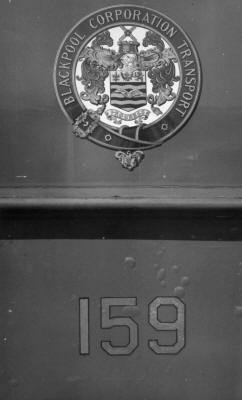 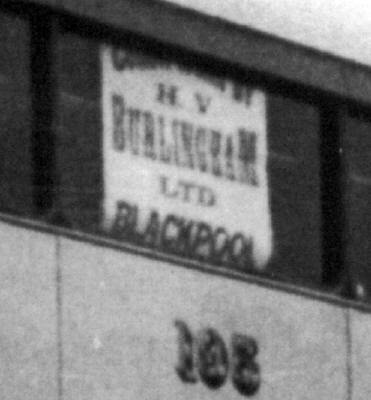 1965 rebuilt as H.M.S.Blackpool Illuminated Car S71R, 1968 renumbered 736. Bus 170 (FV9012) 1937 Leyland Titan TD4, Body H.V.Burlingham FH25/23C, withdrawn 1953. Bus 171 (FV9013) 1937 Leyland Titan TD5, Body H.V.Burlingham FH25/23C, withdrawn 1958. 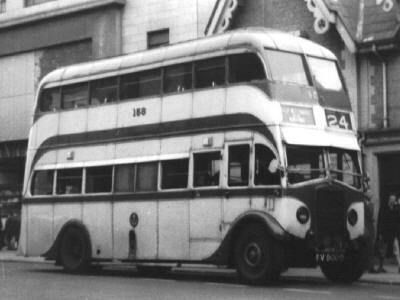 Bus 172 (FV9014) 1937 Leyland Titan TD5, Body H.V.Burlingham FH25/23C, withdrawn 1954. Bus 173 (FV9015) 1937 Leyland Titan TD5, Body H.V.Burlingham FH25/23C, withdrawn 1956. Carriage Illuminated Car S35R, 1968 renumbered 734. 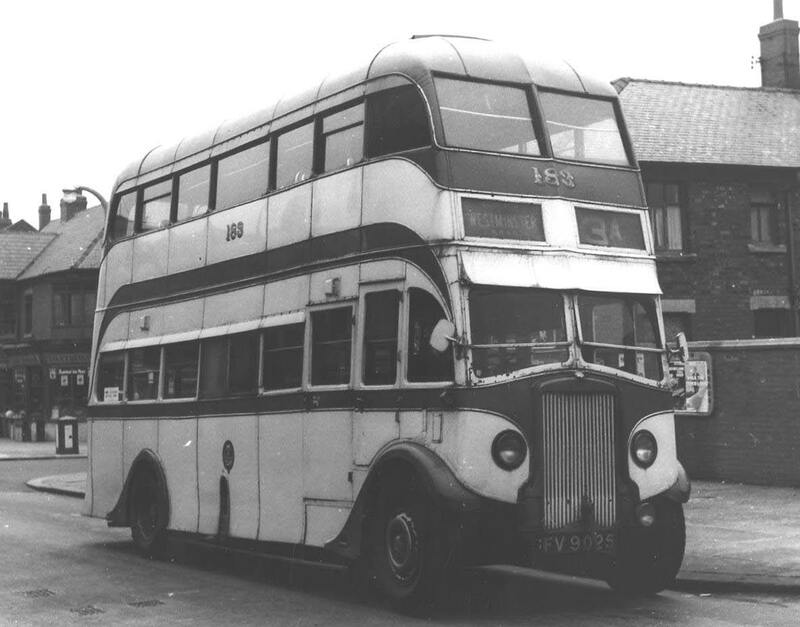 Bus 174 (FV9016) 1937 Leyland Titan TD5, Body H.V.Burlingham FH25/23C, withdrawn 1953. Bus 175 (FV9017) 1937 Leyland Titan TD5, Body H.V.Burlingham FH25/23C, withdrawn 1954. Bus 176 (FV9018) 1937 Leyland Titan TD5, Body H.V.Burlingham FH25/23C, withdrawn 1958. 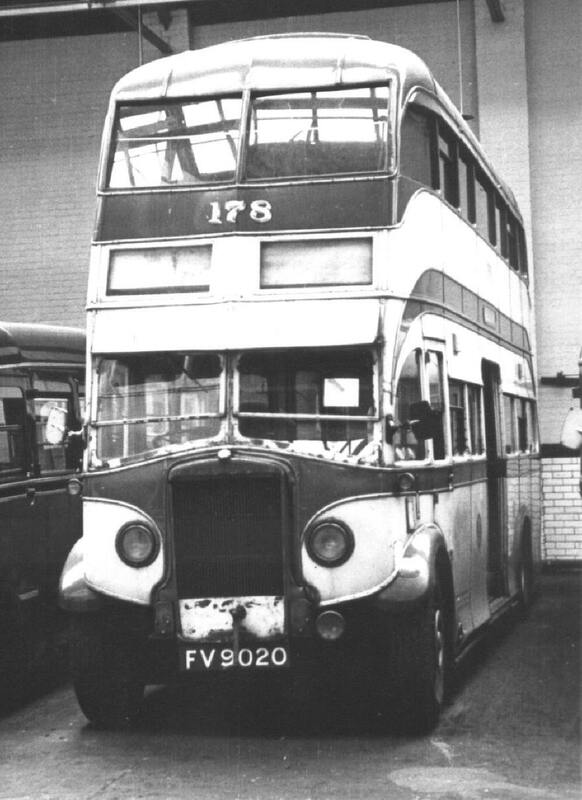 Bus 177 (FV9019) 1937 Leyland Titan TD5, Body H.V.Burlingham FH25/23C, withdrawn 1953. Bus 178 (FV9020) 1937 Leyland Titan TD5, Body H.V.Burlingham FH25/23C, withdrawn 1956. Bus 179 (FV9021) 1937 Leyland Titan TD5, Body H.V.Burlingham FH25/23C, withdrawn 1953. Bus 180 (FV9022) 1937 Leyland Titan TD5, Body H.V.Burlingham FH25/23C, withdrawn 1954. 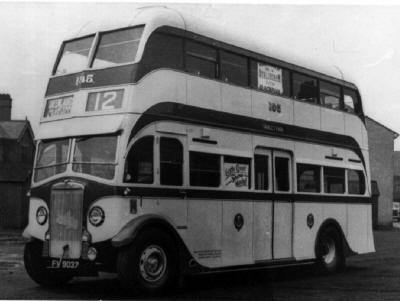 Bus 181 (FV9023) 1937 Leyland Titan TD5, Body H.V.Burlingham FH25/23C, withdrawn 1944. 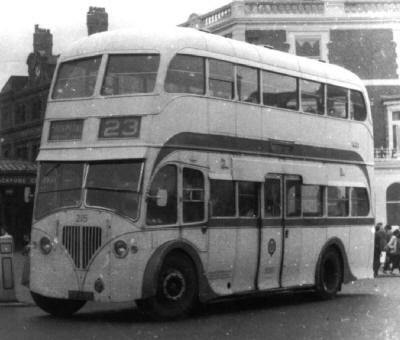 Bus 182 (FV9024) 1937 Leyland Titan TD5, Body H.V.Burlingham FH25/23C, withdrawn 1953. Bus 183 (FV9025) 1937 Leyland Titan TD5, Body H.V.Burlingham FH25/23C, withdrawn 1957. 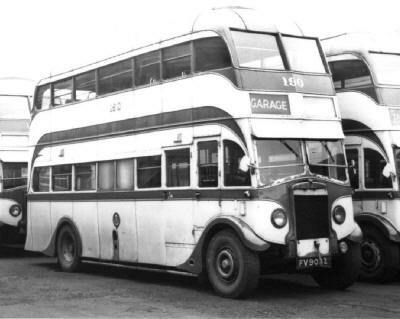 Bus 184 (FV9026) 1937 Leyland Titan TD5, Body H.V.Burlingham FH25/23C, withdrawn 1954. 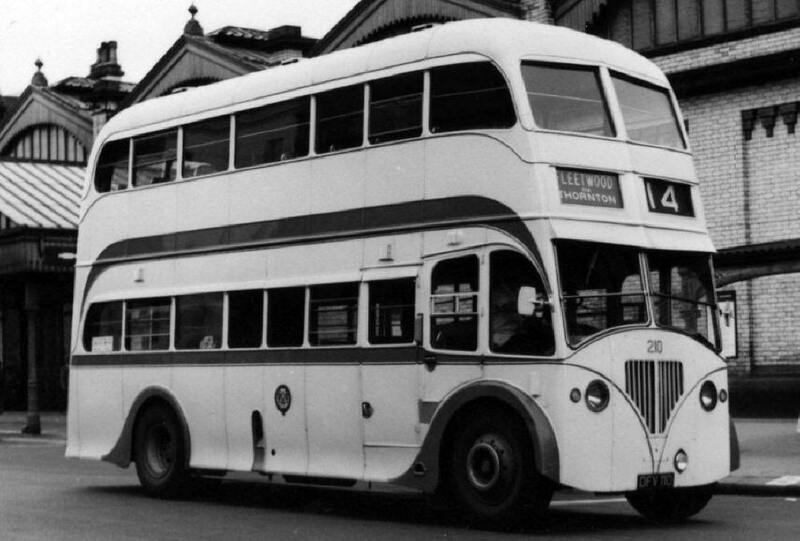 Bus 185 (FV9027) 1937 Leyland Titan TD5, Body H.V.Burlingham FH25/23C, withdrawn 1958. Bus 186 (FV9028) 1937 Leyland Titan TD5, Body H.V.Burlingham FH25/23C, withdrawn 1954. Bus 187 (FV9029) 1937 Leyland Titan TD5, Body H.V.Burlingham FH25/23C, withdrawn 1958. Bus 188 (FV9030) 1937 Leyland Titan TD5, Body H.V.Burlingham FH25/23C, withdrawn 1953. Bus 189 (FV9031) 1937 Leyland Titan TD5, Body H.V.Burlingham FH25/23C, withdrawn 1957. 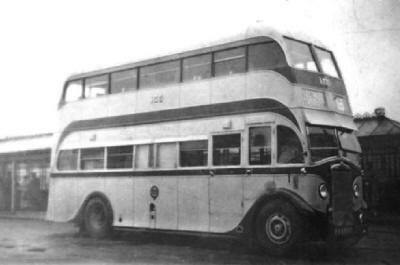 Bus 190 (FV9032) 1937 Leyland Titan TD5, Body H.V.Burlingham FH25/23C, withdrawn 1954. 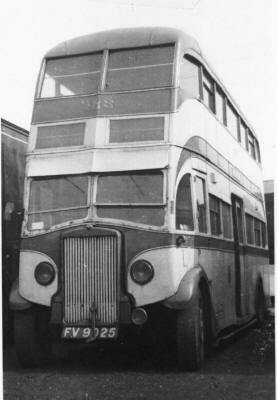 Bus 191 (FV9033) 1937 Leyland Titan TD5, Body H.V.Burlingham FH25/23C, withdrawn 1953. 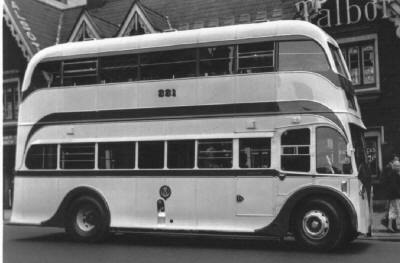 Bus 192 (FV9034) 1937 Leyland Titan TD5, Body H.V.Burlingham FH25/23C, withdrawn 1953. 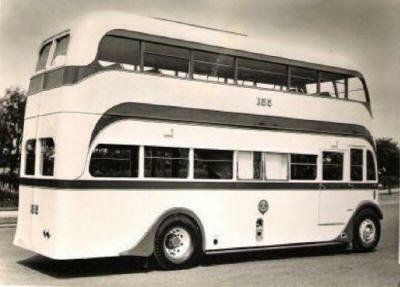 Bus 193 (FV9035) 1937 Leyland Titan TD5, Body H.V.Burlingham FH25/23C, withdrawn 1957. 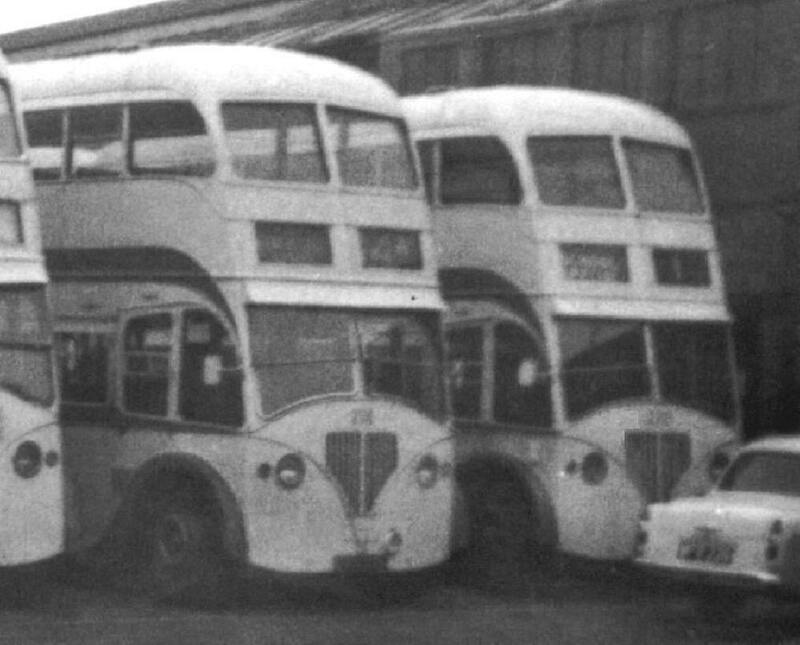 Bus 194 (FV9036) 1937 Leyland Titan TD5, Body H.V.Burlingham FH25/23C, withdrawn 1953. 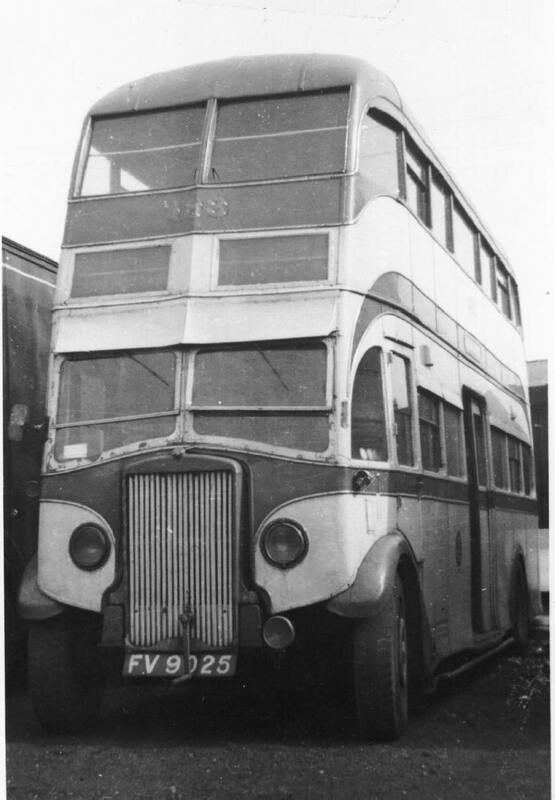 Bus 195 (FV9037) 1937 Leyland Titan TD5, Body H.V.Burlingham FH25/23C, withdrawn 1954. 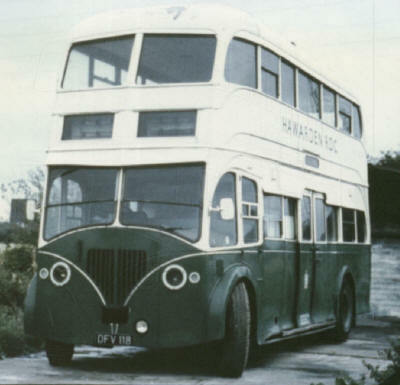 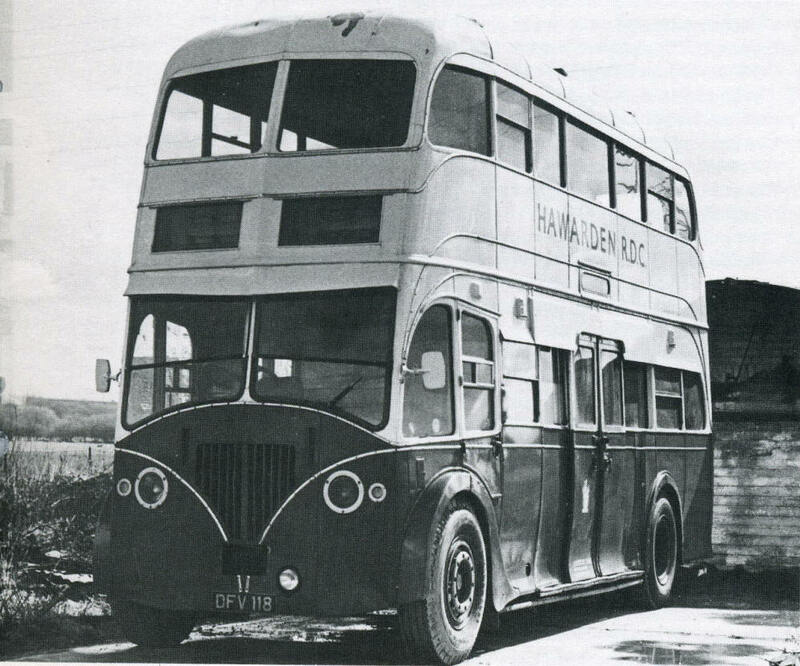 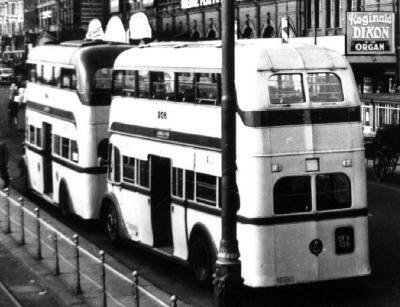 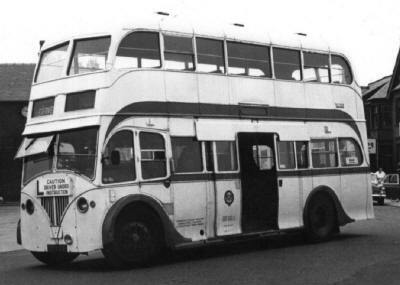 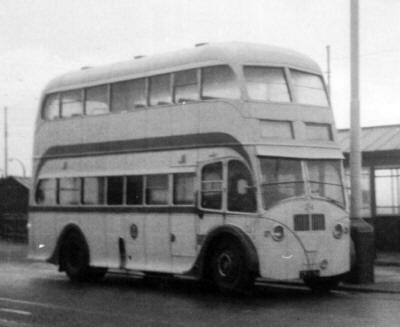 Bus 201 (DFV101) 1949 Leyland Titan PD2/5, Body H.V.Burlingham FH31/23C, withdrawn 1966. 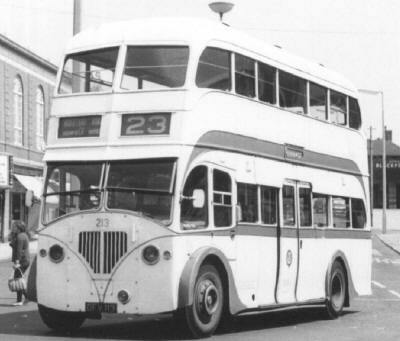 Bus 202 (DFV102) 1949 Leyland Titan PD2/5, Body H.V.Burlingham FH31/23C, withdrawn 1965. 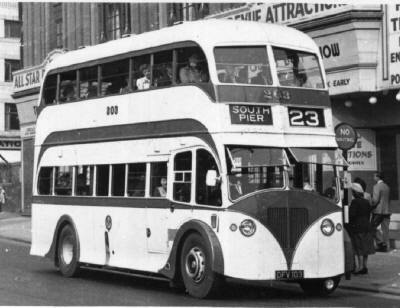 Bus 203 (DFV103) 1949 Leyland Titan PD2/5, Body H.V.Burlingham FH31/23C, withdrawn 1965. 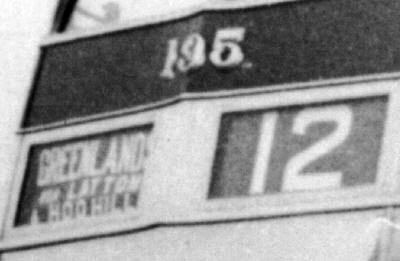 Locomotive Illuminated Car, 1968 renumbered 733. 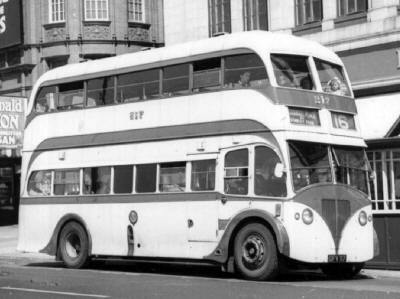 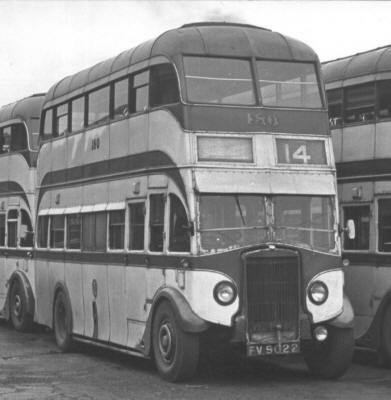 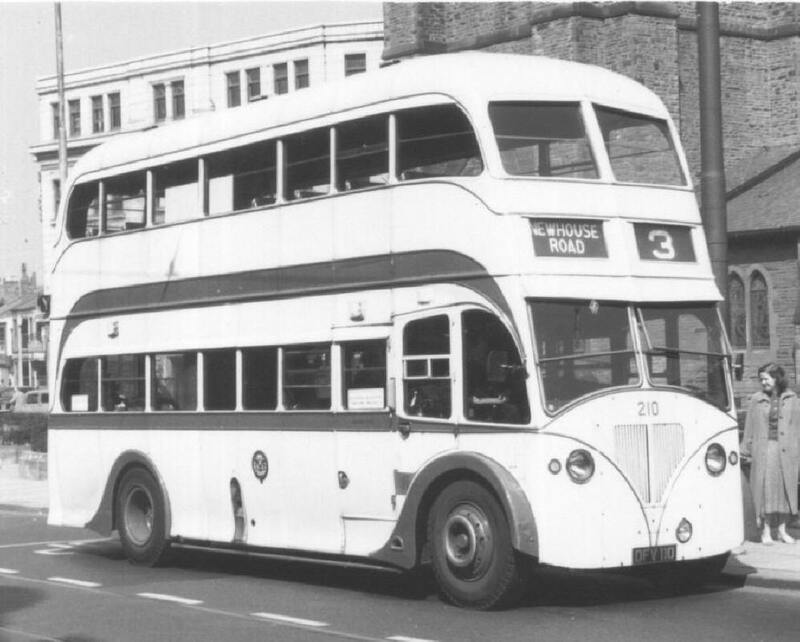 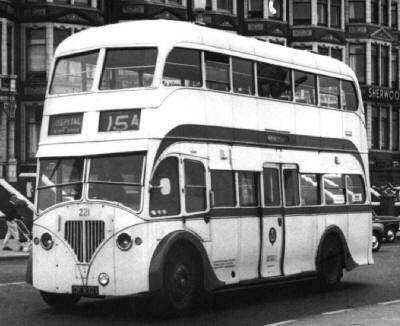 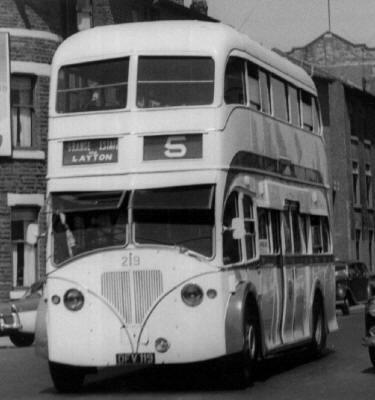 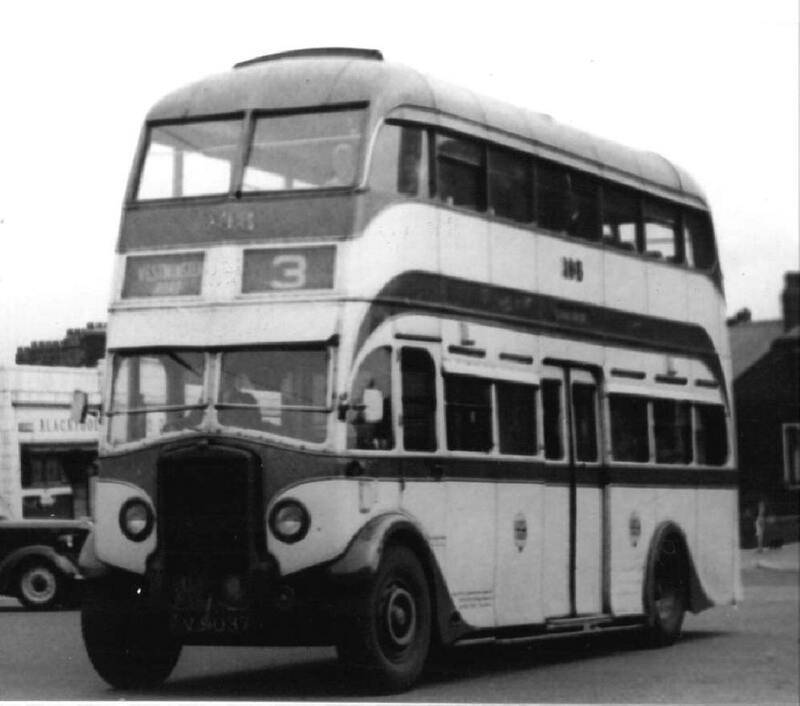 Bus 204 (DFV104) 1949 Leyland Titan PD2/5, Body H.V.Burlingham FH31/23C, withdrawn 1965. 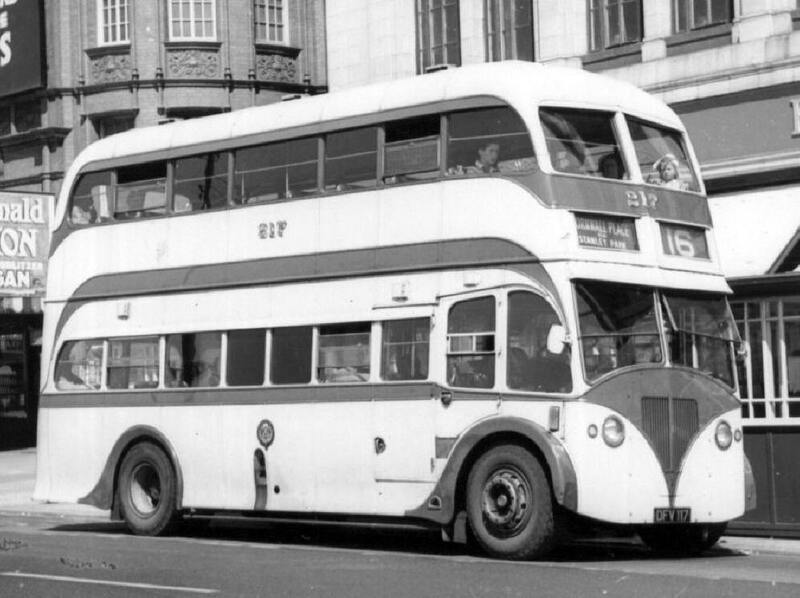 Bus 205 (DFV105) 1949 Leyland Titan PD2/5, Body H.V.Burlingham FH31/23C, withdrawn 1966. 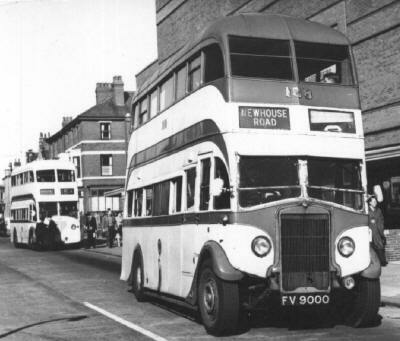 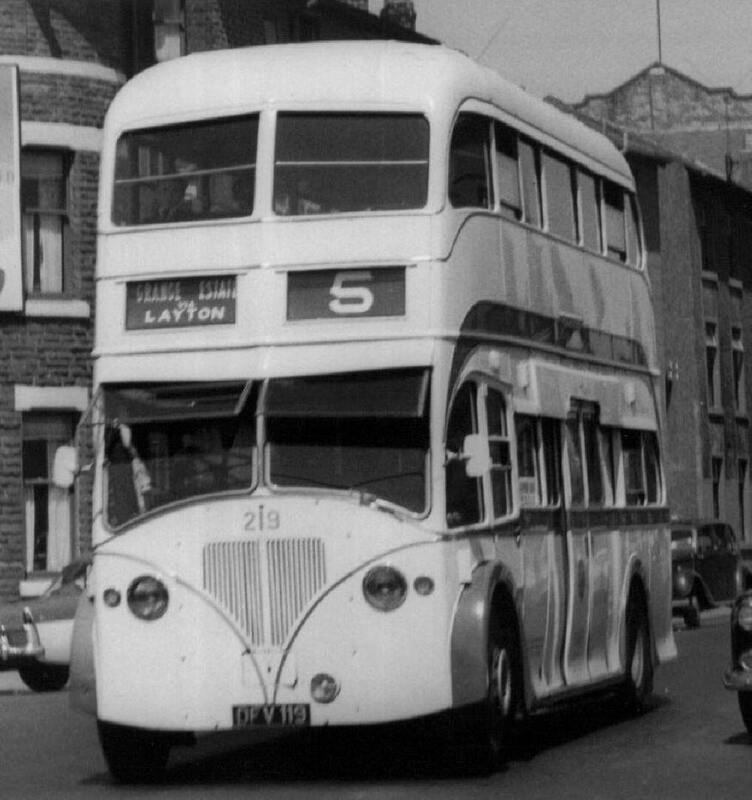 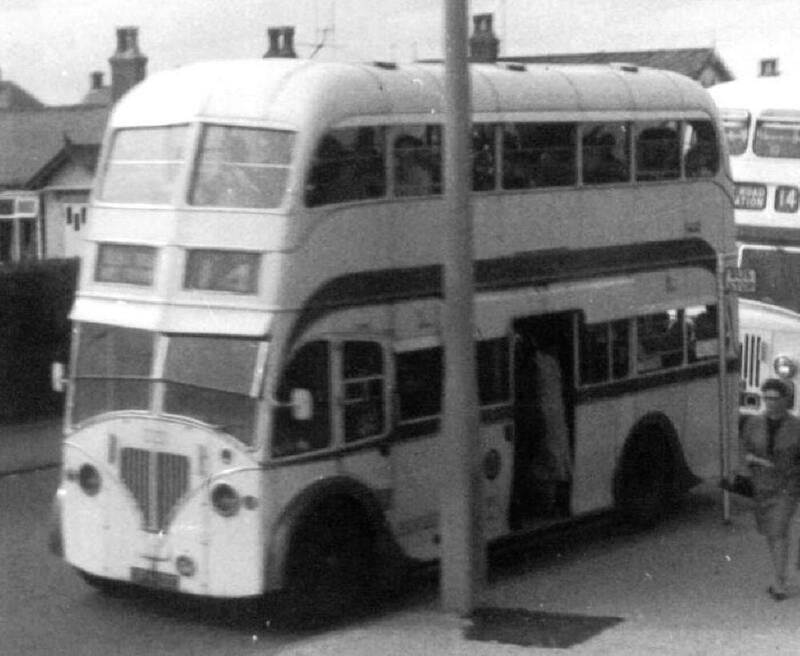 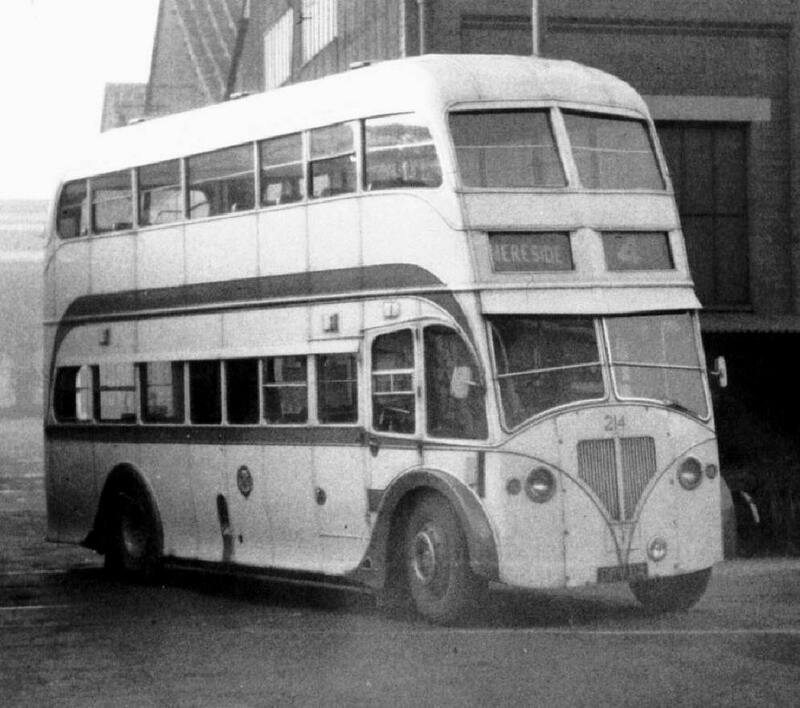 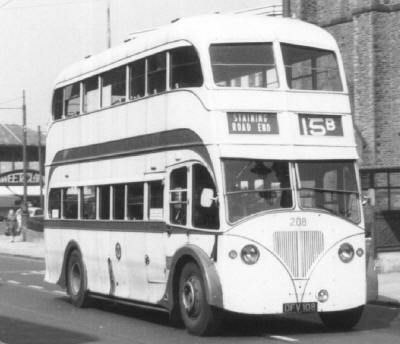 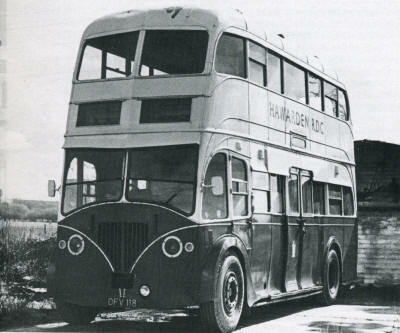 Bus 206 (DFV106) 1949 Leyland Titan PD2/5, Body H.V.Burlingham FH31/23C, withdrawn 1966, became Training Bus. 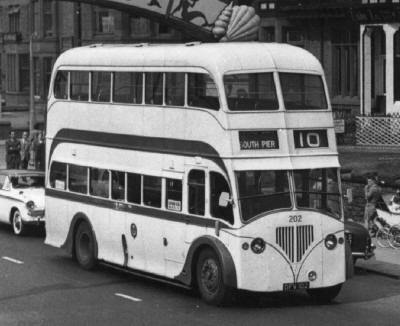 Bus 207 (DFV107) 1949 Leyland Titan PD2/5, Body H.V.Burlingham FH31/23C, withdrawn 1967. 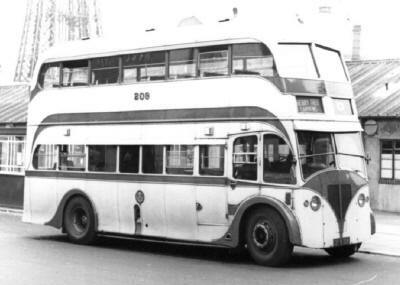 Bus 208 (DFV108) 1949 Leyland Titan PD2/5, Body H.V.Burlingham FH31/23C, withdrawn 1965. 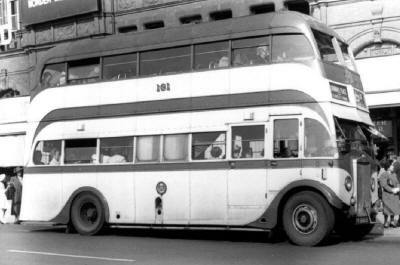 Bus 209 (DFV102) 1949 Leyland Titan PD2/5, Body H.V.Burlingham FH31/23C, withdrawn 1967. Bus 210 (DFV110) 1949 Leyland Titan PD2/5, Body H.V.Burlingham FH31/23C, withdrawn 1967. 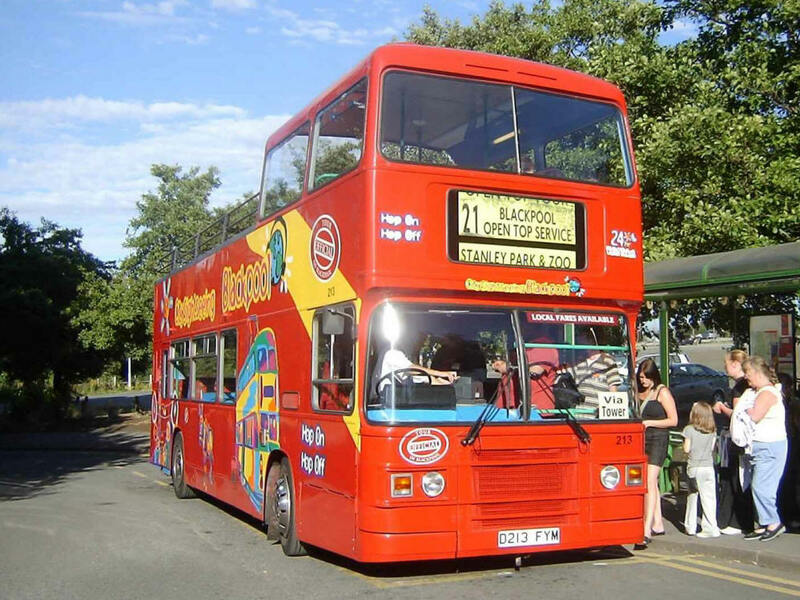 Bus 210 (T210HCW) 1999, Optare Excel L1150, Body by Optare B40F. Bus 211 (DFV111) 1949 Leyland Titan PD2/5, Body H.V.Burlingham FH31/23C, withdrawn 1967. Bus 211 (T211HCW) 1999, Optare Excel L1150, Body by Optare B40F. 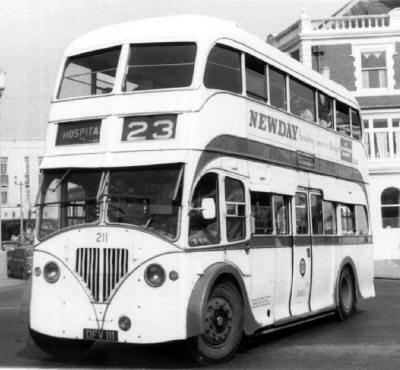 Bus 212 (DFV112) 1949 Leyland Titan PD2/5, Body H.V.Burlingham FH31/23C, withdrawn 1967. Bus 212 (T212HCW) 1999, Optare Excel L1150, Body by Optare B40F. 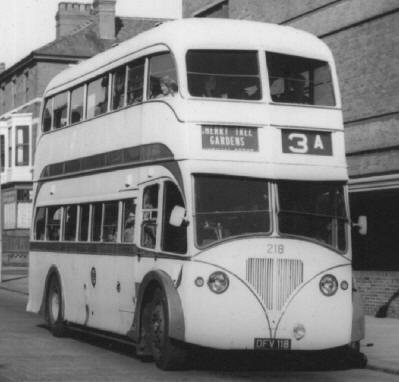 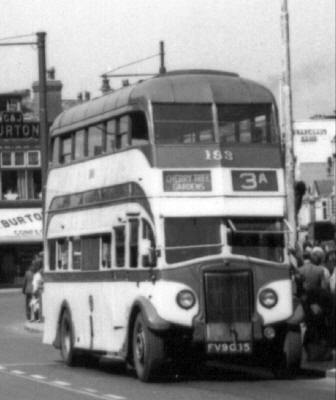 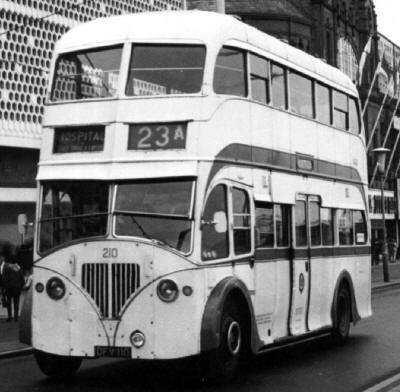 Bus 213 (DFV113) 1949 Leyland Titan PD2/5, Body H.V.Burlingham FH31/23C, withdrawn 1967. Bus 213 (T213HCW) 1999, Optare Excel L1150, Body by Optare B40F. 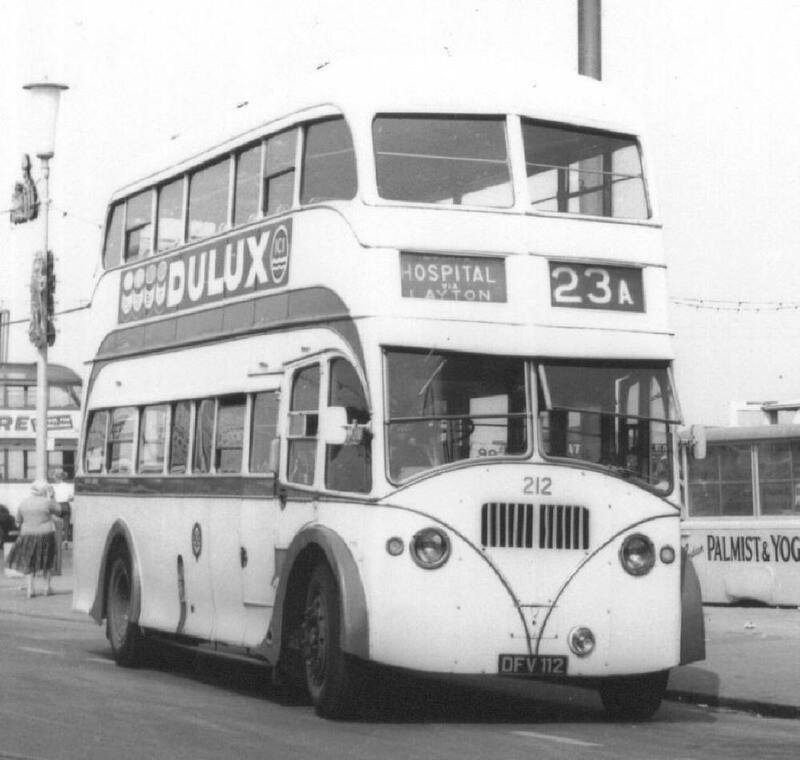 Bus 213 (D213FYM) 1986 Leyland Olympian ONLXB/1RH, Body Eastern Coach Works O42/26D, ex Ensign Purfleet 2006. 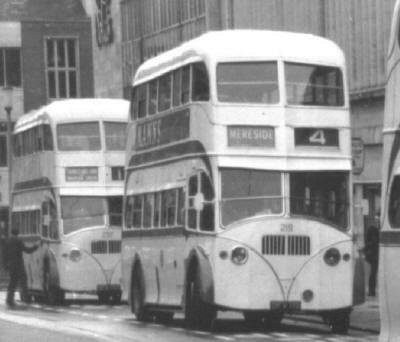 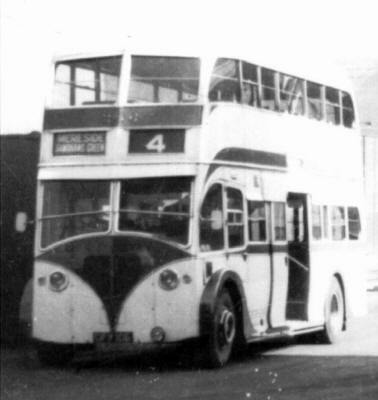 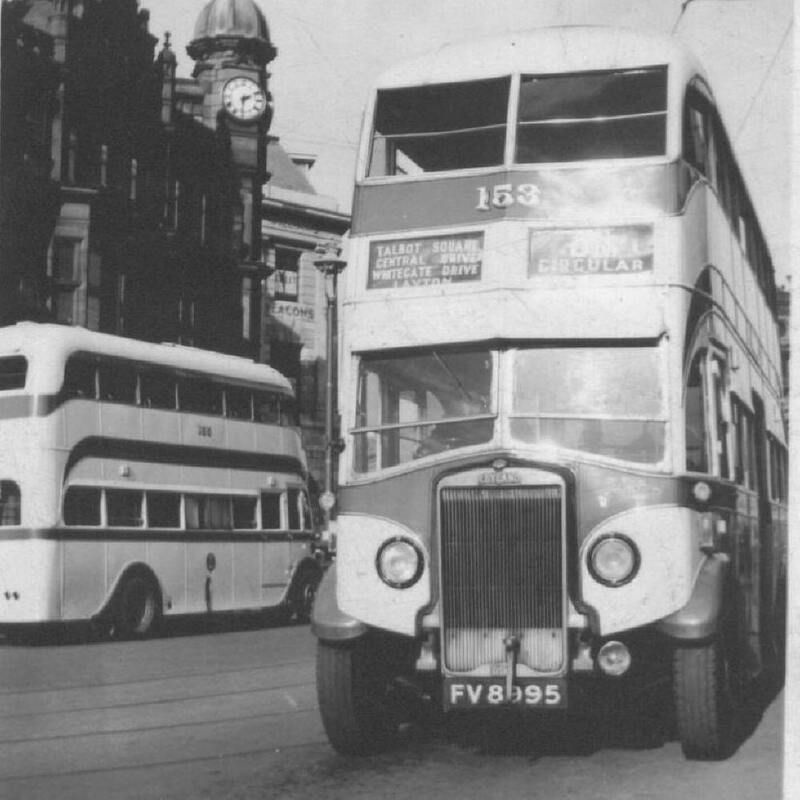 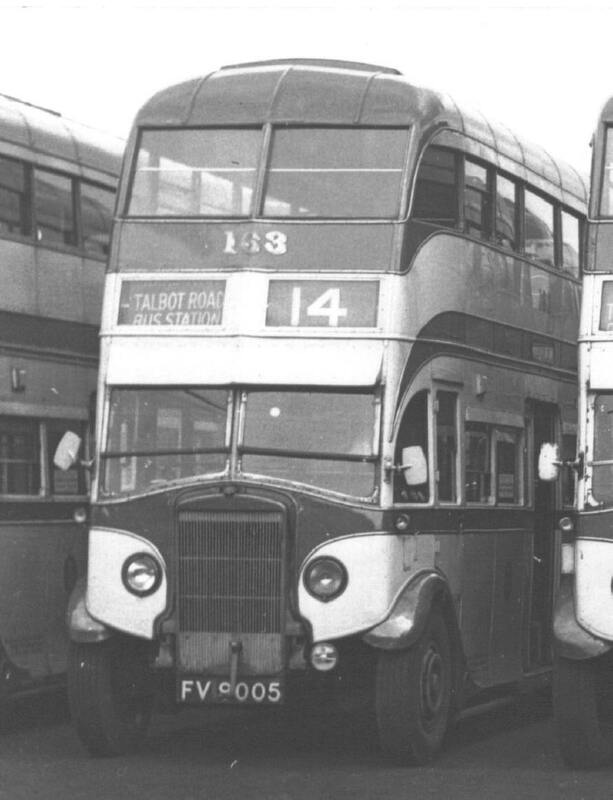 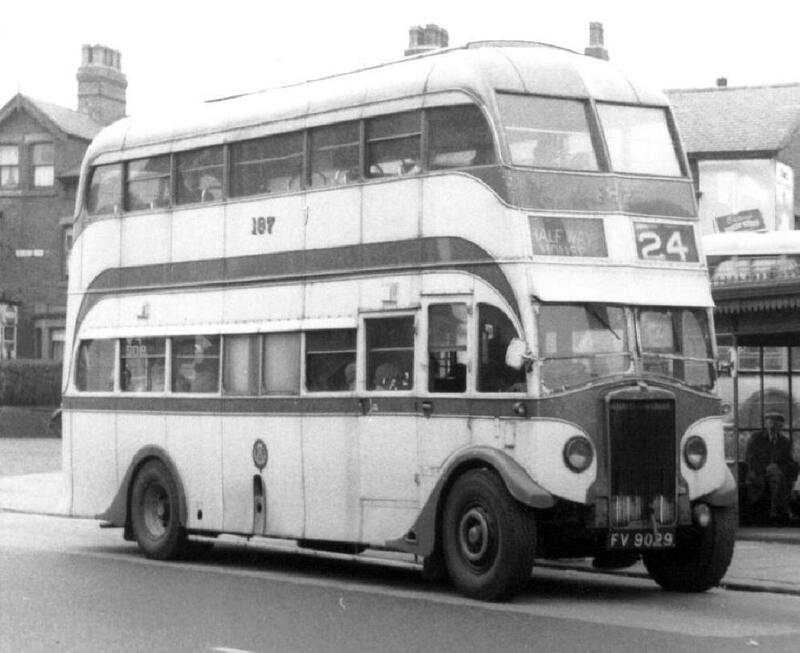 Bus 214 (DFV114) 1949 Leyland Titan PD2/5, Body H.V.Burlingham FH31/23C, withdrawn 1967. 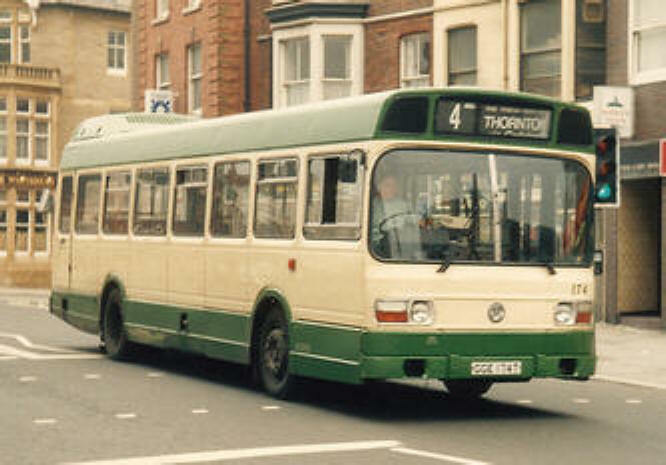 Bus 214 (T214HCW) 1999, Optare Excel L1150, Body by Optare B40F. 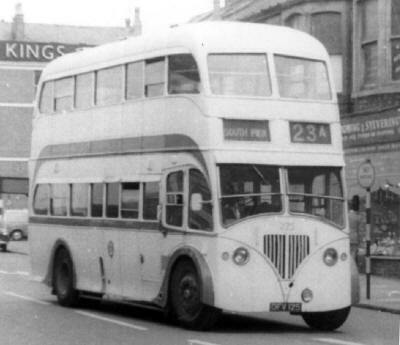 Bus 215 (DFV115) 1949 Leyland Titan PD2/5, Body H.V.Burlingham FH31/23C, withdrawn 1967. 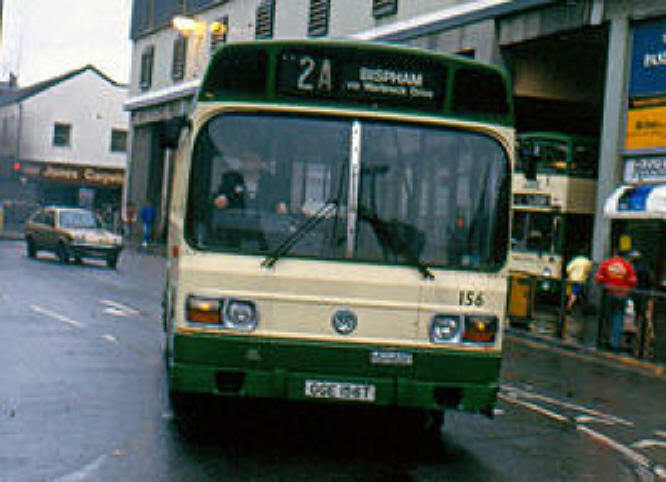 Bus 215 (T215HCW) 1999, Optare Excel L1150, Body by Optare B40F. 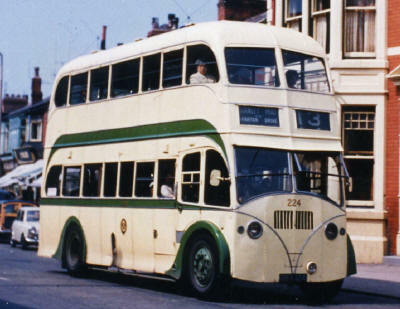 Bus 216 (DFV116) 1949 Leyland Titan PD2/5, Body H.V.Burlingham FH31/23C, withdrawn 1967. 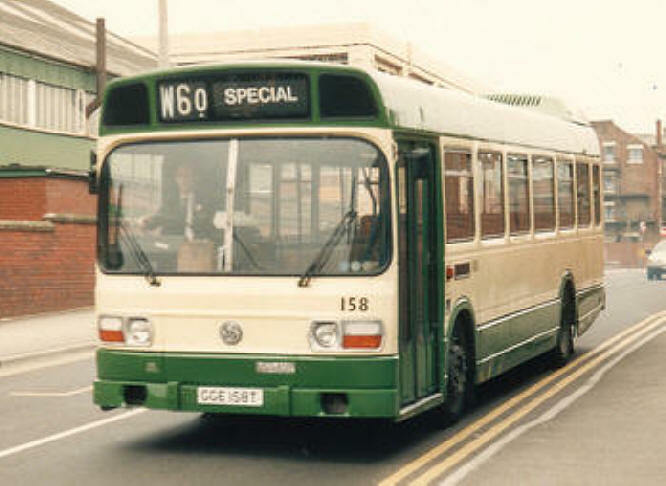 Bus 216 (T216HCW) 1999, Optare Excel L1150, Body by Optare B40F. 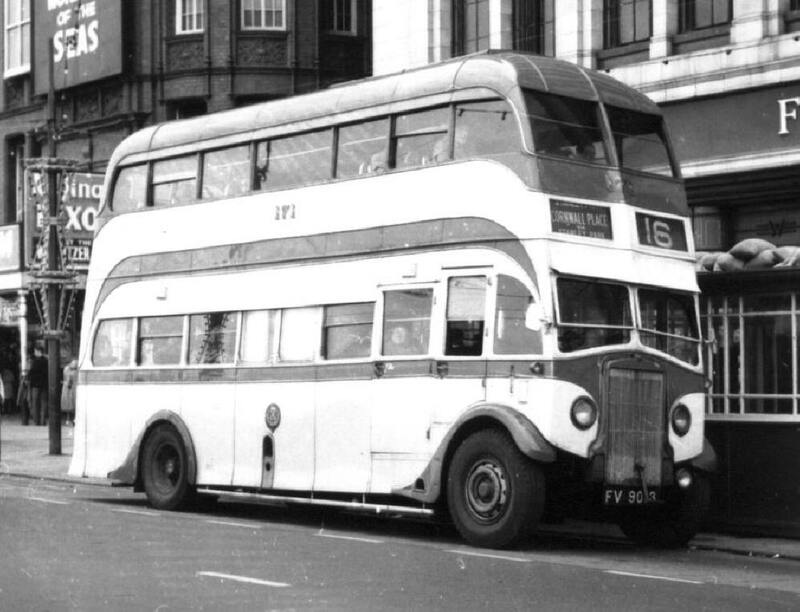 Bus 217 (DFV117) 1949 Leyland Titan PD2/5, Body H.V.Burlingham FH31/23C, withdrawn 1963. 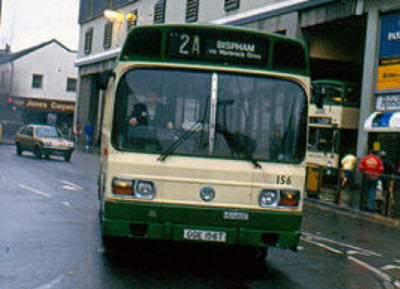 Bus 217 (T217HCW) 1999, Optare Excel L1150, Body by Optare B40F. 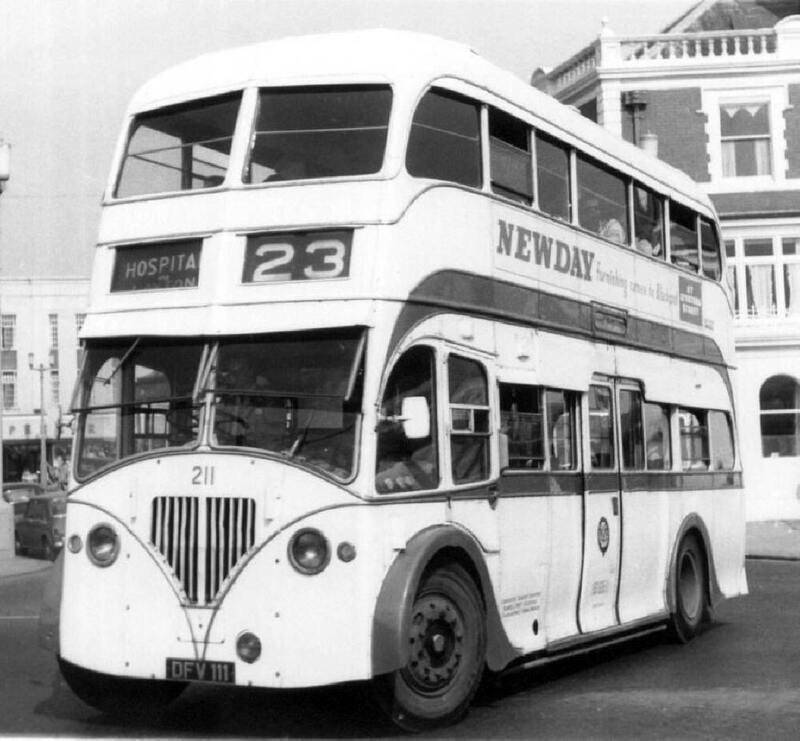 Bus 218 (DFV118) 1949 Leyland Titan PD2/5, Body H.V.Burlingham FH31/23C, withdrawn 1967. 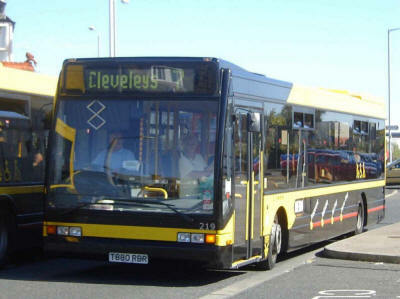 Bus 218 (T218HCW) 1999, Optare Excel L1150, Body by Optare B40F. 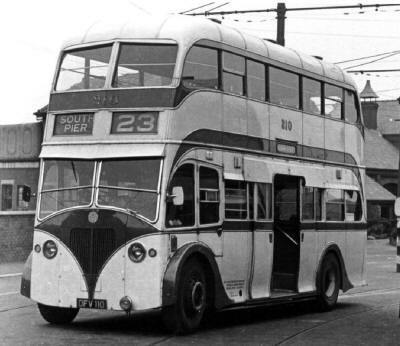 Bus 219 (DFV119) 1949 Leyland Titan PD2/5, Body H.V.Burlingham FH31/23C, withdrawn 1966. 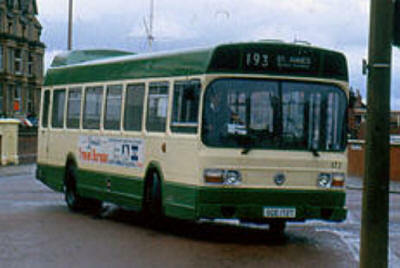 Bus 219 (T880RBR) 1999, Optare Excel L1150, Body by Optare B41F, ex Go Coastline 2004. 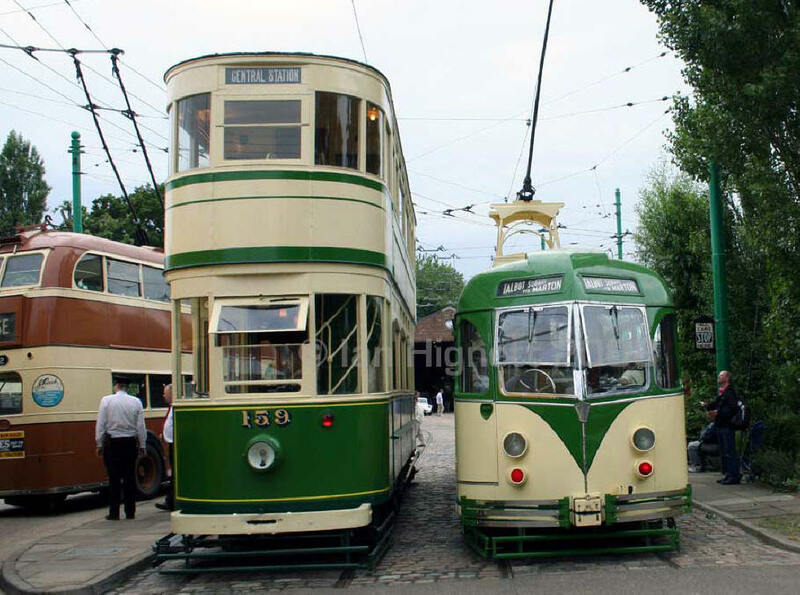 Tram 220 1934 Railcoach Built by English Electric, Trucks by English Electric, Motors EE305 S48C, withdrawn 1963, 1968 renumbered 608. 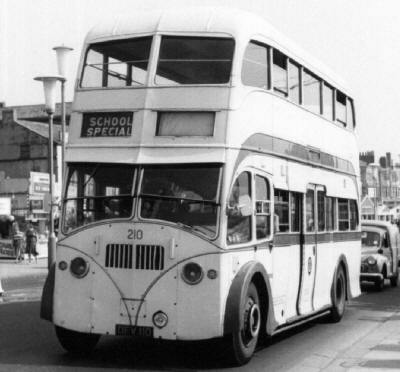 1972 became One Person Car 4 S48D, withdrawn ?. 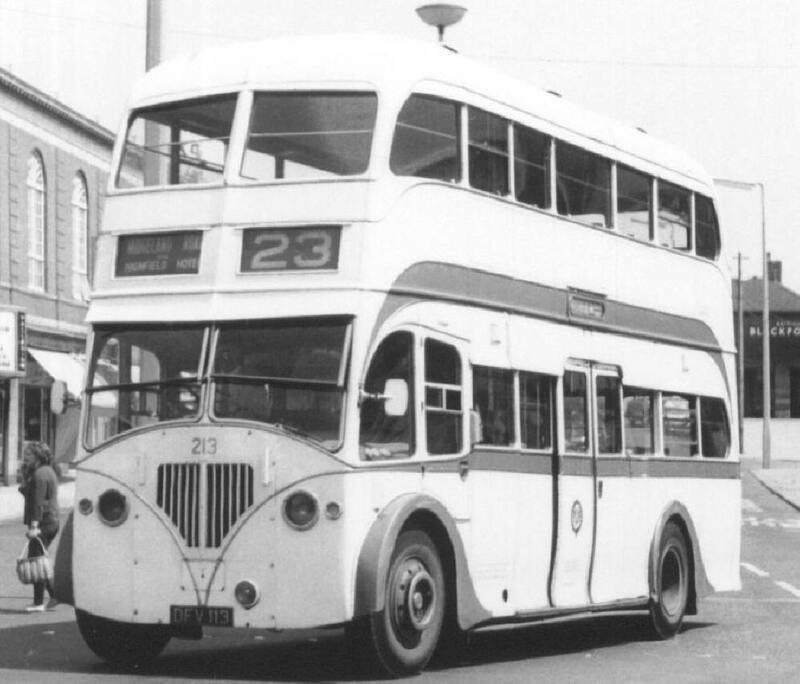 Bus 220 (DFV120) 1949 Leyland Titan PD2/5, Body H.V.Burlingham FH31/23C, withdrawn 1967. Bus 220 (T881RBR) 1999, Optare Excel L1150, Body by Optare B41F, ex Go Coastline 2004. 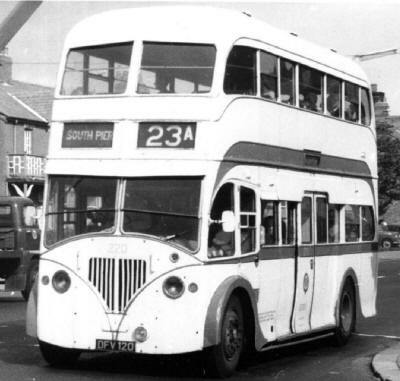 Bus 221 (DFV121) 1949 Leyland Titan PD2/5, Body H.V.Burlingham FH31/23C, withdrawn 1966. Bus 221 (T882RBR) 1999, Optare Excel L1150, Body by Optare B41F, ex Go Coastline 2004. Car D42/57R, 1968 renumbered 735. Bus 222 (DFV122) 1949 Leyland Titan PD2/5, Body H.V.Burlingham FH31/23C, withdrawn 1967. 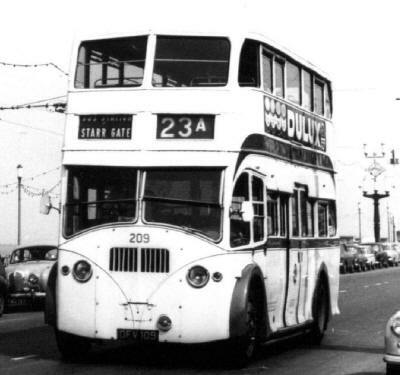 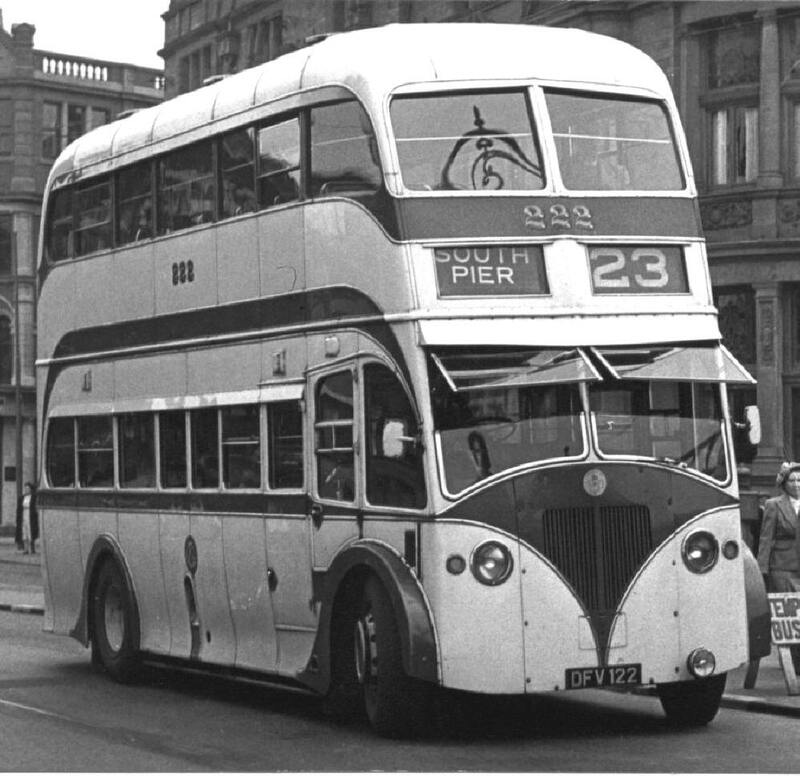 Bus 223 (DFV123) 1949 Leyland Titan PD2/5, Body H.V.Burlingham FH31/23C, withdrawn 1967. 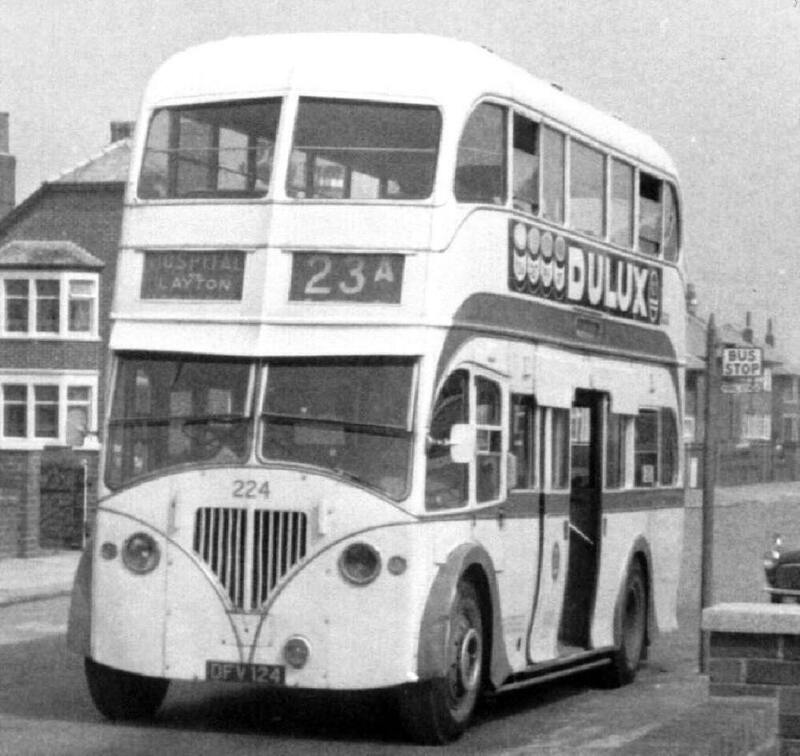 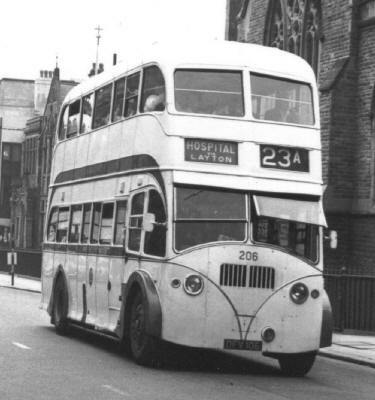 Bus 224 (DFV124) 1949 Leyland Titan PD2/5, Body H.V.Burlingham FH31/23C, withdrawn 1967. 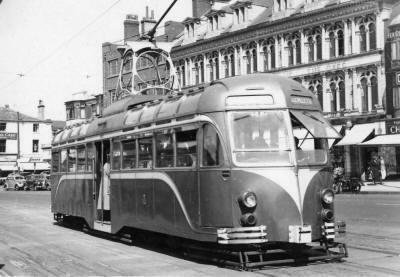 Tram 225 1934 Luxury Toastrack (open Boat Car) Built by English Electric, Trucks by English Electric, Motors EE327 OS56C, 1968 renumbered 600. 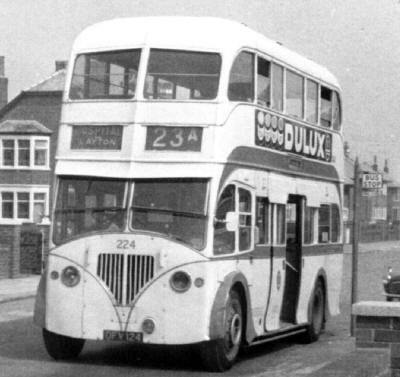 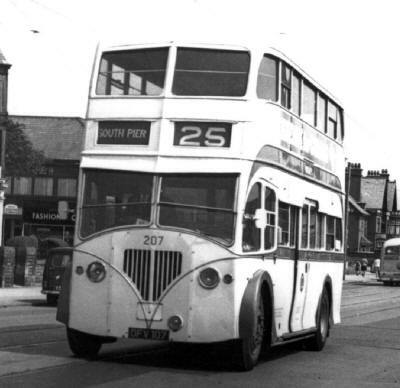 Bus 225 (DFV125) 1949 Leyland Titan PD2/5, Body H.V.Burlingham FH31/23C, withdrawn 1967.